6:28 AM The Reformation that began 488 years ago today is not over. It is time to amend ourways. Some things are not to be accepted but challenged and changed. The problem with our generation is that we fail to get to the root of our troubles. We spread talcum powder on cancer and use a feather duster to get rid of deeply-ingrained unbiblical traditions. It is time to forsake all such temporary palliatives. No longer can we remain silent about a church that has become cluttered with superficial “believers” who refuse to sell all and follow Jesus. Let us return to the solas of the Reformation. Let us believe the Word of God and receive it for what it is, letting God be true and every man a liar. Let us refuse to soothe the unsaved with a false peace or stir them with an artificial joy. Let us stand – and stand alone if necessary – for conviction and principle. Instead of dodging issues, let us meet them head-on as Paul did at Corinth. Above all, let us weep for our sins that put Christ on the cross, our iniquities that made Calvary necessary, and our godless traditions that led to Good Friday. God is ready to work in us to will and do that which He expects. To be satisfied with anything less is to doubt and disobey God. Let us raise the horizons of our expectations and believe God for the “above and beyond” (Eph. 3:20)! The Great Awakener of the church, of whom it is said “He stirreth up the people” (Luke 23:5), is sounding the reveille. Every Christian ought to be a co-agitator, working with God to awaken a church stupefied with the spirit of deep sleep. 6:44 AM What does the German word "Gift" mean? Poison, of course. Such terms are known as "false friends," and the causes of such confusing terminology are spelled out in this delightful little essay. By the way, I've noticed that this lack of genuine linguistic amity tends to make German-speakers say things like: "I am here since an hour. When do I become a hotdog?" I shudder to think of how many similar linguistic foibles I've made when speaking German. 6:38 AM Wayne Leman has a series at his site called "Meet a Translator." Here's an entry I found interesting and enlightening. 6:32 AM Is it right to use the word "office" to describe the ministry of a pastor in the local church? 6:25 AM On October 31, 1517, Martin Luther posted his 95 gripes about indulgences on the bulletin board at the Wittenberg church. If anyone knows me, you'll know that I wish he had taken the reformation a wee bit further. The five solas are great and ought to celebrated. But Jesus and His apostles were not silent about the church they envisioned. Why, then, do we continue to pour new wine into the same old wineskins? Let's face it: the doctrine of the church is not taught well in our assemblies. Maybe it's time we unleashed the church. 6:21 AM Why not take a moment and remind your children that “He who is in you is greater than he who is in the world” (1 John 4:4); that we can “resist the devil and he will flee from you” (James 4:7); and that through the cross Christ has “disarmed principalities and powers,” and “made a public spectacle of them, triumphing over them” (Col. 2:15)? Might the church (and for that matter the college), learn something about how to train disciples in the way of the kingdom? If the church is to cultivate depth of character, wise readers of Scripture, and a discerning engagement with our culture we desperately need concrete examples of those who embody such virtues. And they must be willing to invest their time to inspire others with a passion for the kingdom of God. Next we need to ask what sort of things a new believer needs to know to become a witness to the reality of God's Reign. The mentors in my life have meant everything to me, not only during my youth but today. Jim Cook in Honolulu adopted me as one his "preacher boys," and more recently my friend Bill, who has been ministering for over 50 years, has been a wonderful prayer partner (I was born the year he began pastoring). If Christian education is essentially likewise education (Luke 6:40), then teaching will be much more than disseminating information. Who are the mentors in your life? And who are you mentoring? 6:10 AM Can't wait to read this book. 6:04 AM Now here's a novel idea for a teaching series at church (with apologies to RW): Forty Days of the Bible. 9:25 AM A Swedish couple have named their baby -- what else? -- Google. 9:22 AM Greek students! 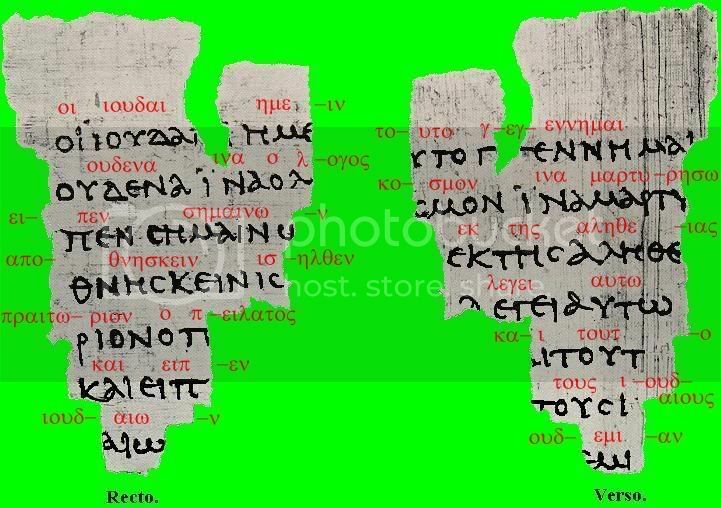 Here's a new blog dedicated to textual criticism. 9:20 AM I continue to be pleased and amazed at what God is doing in reforming Baptist thought and life. Here's a good example from the conference going on in Florida: God-Centered Evangelism. 9:17 AM Here's my prayer request for today: Please pray for Becky Lynn who is under the weather and taking antibiotics. 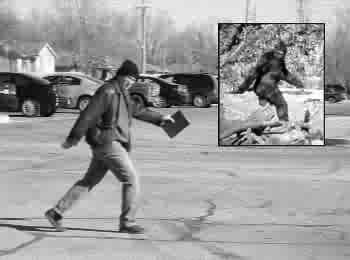 9:15 AM Caught on film! Man actually brings Bible to church with him! For what we proclaim is not ourselves, but Jesus Christ as Lord, with ourselves as your servants for Jesus' sake (2 Cor. 4:5). We preach "Jesus is Lord," but we also make ourselves servants to others. People won't hear the words unless we play the music. 1) The Internet is an absolutely marvelous tool for the kingdom when used wisely. 2) Blogging has given DBO a personal touch that it lacked before and that makes complete strangers feel like they know us and we them. 3) The modicum of trust that individual believers put in us and our work in Ethiopia is terrifying, humbling, and appreciated -- all at the same time. 9:02 AM News and notes: Becky and I will be sharing about our Ethiopian ministry at Amis Chapel Baptist Church this Sunday at 11:00. We'll be showing snaps of the churches in Burji and Alaba -- the places where we'll be ministering this December/January. We have a wonderful team lined up in Ethiopia to help us with evangelism, Bible distribution, etc.... The latest issue of the Journal of the Evangelical Theological Society has a great article on the meaning of the Greek word tekton. The author argues (correctly) that the word is best rendered "builder" and not the more traditional "carpenter." 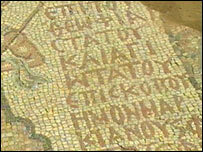 It also has a neat summary of the construction and agricultural language of Jesus.... Yesterday I managed to haul enough brick to complete the second floor chimney over at my son's farmhouse. He will need the heat; it already feels like winter around here.... The good news about the colder weather is that hunting season is just around the corner. Time to sight in the rifles.... We cut hay last weekend and think we can still get in one last bailing this year. If so, that would make two cuttings this season (as opposed to four last year), but we are grateful for every bale we get. 7:05 AM I hope to make several of these sessions at ETS this year. 7:05 AM Reading Darrell Dow's latest, it appears that I'm not the only recovering neocon. We have posted, right here at DBO, a wealth of analysis by leading constitutionalists asserting that, regardless of the man living in the Presidential Palace, American imperialism leads to some very unhappy things. 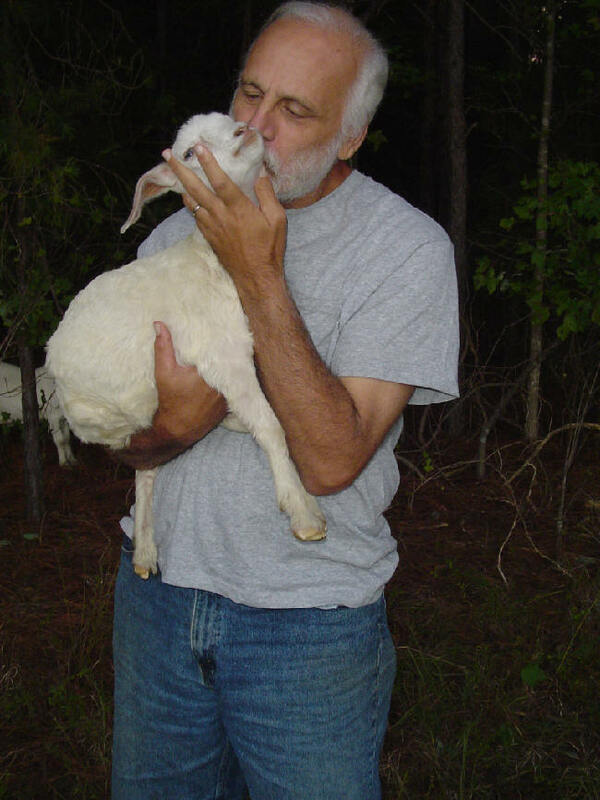 As you read Darrell's confessions try to remember what this great nation was intended to be. 6:45 AM If you read Portuguese, you may be interested in this edition of one of my books. 6:42 AM Ethiopia, D.C. style. 6:38 AM Personally, I would have given Sherlock Holmes the number one spot in this list. I'm not sure if you remember or not, but I spoke to you this past August in your office about textual criticism and Greek.... I've been meaning to let you know that I thoroughly enjoyed "It's Still Greek to Me." It was an excellent refresher for me going into the new semester and it made so many complex issues clear. I am very grateful for your hard work. I hope your semester is going well. It's simply amazing to me to think that this grammar is being used in colleges and seminaries in such faraway places as Ethiopia. Not that these international students can't understand the Greek grammar -- I'm quite sure they can. But what in the world do they do with such silly puns as "Up the Greek Without a Paddle" and "To Koine Phrase"? Amazing. 6:30 AM The phone rang at my office yesterday, and when I picked it up the voice on the other end said, in Greek, ego eimi Iesous, which means, “I am Jesus.” Not to worry, though. It was a young home scholar named Joshua whom I am tutoring in Greek. He was calling to go over his weekly translation assignment. If you haven’t guessed it already, “Jesus” in Greek can also be rendered “Joshua.” Congratulations, young man, and keep up the good work. 6:23 AM With our retreat ministry here at Bradford Hall we seek to imitate (to a degree) the work of Francis and Edith Schaeffer at L'Abri in Switzerland. The Pearcey Report does a splendid job of laying out the Schaeffer's distinct approach to evangelism, apologetics, and hospitality. Becky and I can certainly second the motion when it comes to their attitude toward advanced "planning." Reading this essay I was also reminded of how difficult it was for the Schaeffers to work among the Swiss, who suspected them as being not very menschenfreundlich. That comes with the turf, no doubt, but it is never a pleasant way the live one's life. Hat's off to them for their endurance and faithfulness to the call of God in their lives and for the splendid example they set for the rest of us. 6:18 AM Speaking as a free-market constitutionalist, I couldn't agree more with this provocative piece by Chuck Baldwin: What Does It Mean to "Prefer Christians" As Our Leaders? 6:15 AM A big cyber hug to Becky Lynn for providing refreshments for my Greek students yesterday afternoon. 6:00 AM As usual, up early today to feed the calves and get some farm work done, like stacking wood and hauling bricks upstairs as we try to complete Nathan's chimney. It's already bitter cold in Southside Virginia. Hope to get a good long ride in this afternoon. In this weather Traveler is wonderfully frisky. 6:58 AM Dave Black has made Wikipedia! 6:55 AM Go here to learn about intense hurricanes called "hypercanes." 6:53 AM Don't mean to wax inconvenient here, but over at LRC Karen Kwiatkowski has some advice for Mr. Bush now that we are stuck in Iraq. I prefer her first suggestion, even though I would be satisfied if her second scenario panned out. One thing seems certain: We as a nation need to get back to the Constitution, n'est pas? 6:50 AM Lithuania Christian College announces a position in missiology. 6:47 AM Why in the world do we call the Hellenes "Greeks"? 6:43 AM Greek language lovers out there, may I call your attention to this nifty essay onspecial linguistic providence? It's an interesting read because it reminds us that the Greek of the New Testament is not a special "Holy Ghost" language that God invented in order to inscripturate New Testament truth. How often have I heard the saw, "Greek is the most complex and sublime expression of human language the world has ever known." One could argue (successfully, in my view) that English is just as sublime and complex. Both English and Greek are rich languages, but their richness lies in different areas. Greek uses an abundance of verb endings, for example, whereas English prefers to use analytical expressions. We therefore need not rhapsodize about the wealth of Greek forms, as do Dana and Mantey (p. 177): "The development of tense has reached its highest in Greek, and presents its greatest wealth of meaning." Judged in the only way a language can be judged -- as a means of communication -- neither Greek nor English nor any other language will be found wanting. One other little observation, if you will. It seems to me to be just as inane to overemphasize a linguistic approach to the Greek language, as if linguistics were the abracadabra or the open sesame to New Testament interpretation. I realize I've written a couple of books on this already, but it bears repeating: linguistics is not an end in itself. It is, like all methods and disciplines, ancillary to the real purpose of language -- that of communication. Teachers and students who merely adopt linguistic jargon like "semantic neutralization" or "monophthongization" are neither modern nor progressive. Only when linguistic analysis leads to a significant understanding of the New Testament text itself can the whole process be justified. 6:40 AM Yesterday I reported that we would be in Ethiopia in a week. I meant to say in six weeks. Sorry. I hope this helps the children. K. has saved her offering and spending money ever since we received your letter. In Christ we hope this helps. Mom. Dear Dr. and Mrs. Black. Thank you for bringing God's message of love and hope to all of us at [church name]. Please accept this small amount in support of your ministry in Ethiopia. May God strengthen and sustain you as you minister to the Ethiopians! Mrs. Black. Thank you so much for opening your home to all of us last weekend. My husband and I had an excellent time relaxing and enjoying God's blessings. You have a beautiful home and farm. Thank you for your willingness to open your home to us ... it has further confirmed to us that we are truly blessed to be at Southeastern. Thanks to your son, Nathan, as well for all he did. Our deepest appreciation to all who write. We have such wonderful friends. Becky and I consider ourselves the most blessed people on this terrestrial orb. 6:34 AM The latest addition to our home page is called Greener-Pasture Pastors. 6:31 AM If you live near Wake Forest please plan on joining us for an organ/piano recital presented by our good friend Dr. Nannette Godwin, organist extraordinaire. Date and time are November 7 at 7:00 pm. Maybe she'll even play Buxtehude just for me. 6:28 AM The political situation in Ethiopia continues to worsen. We received this letter yesterday from a theological student I taught last summer. The last thing I want to share with you is that the prayer request concerning our nation Ethiopia. The situation is not stable enough so that the people continue the normal life. The tension is still here among the political parties and also in the midst of the people. I am afraid that unless God intervene through the situation the consequence will be very painful and messy. Please convey this prayer item and share for other saints too and intercede for our country and people. The main opposition party, following its boycotting the parliament, calls “subsequent “strategies of mass opposition throughout the country just after the day of Ramadan. So don’t we need to pray a lot, dears? 6:25 AM The Bikehiker makes some convicting comments about reading the Bible -- and living by it. It seems to me that those of us who claim to know Jesus “better” than others would do well to get to know the Bible better ourselves. As we do, more of us will discover that we are being unmistakably called to realign our personal and political priorities and passions. As we do, more of us will be called upon torecant our unholy alignments with political wolves dressed in sheep’s clothing. As we get to know what concerns God most repeatedly and thoroughly throughout the multi-millennial cosmic recovery effort, more of us will be challenged to break with both the dominant culture and pseudo-evangelical subculture and to live with radical abandon the Kingdom that is within us, among us, and still yet to come. 6:22 AM Our local association of SBC churches in southern Virginia is currently without a DOM (Director of Missions). I have argued that our limited funds could better be used for missions and mercy ministries than in hiring more staff for the associational office. Let local volunteers do the work of the association! I thought I was alone in thinking this way until I stumbled upon Jim Smyrl's wonderful blog. Read "Do We Need An Association?" Part I and Part II. "Will you pray? The Burji People need help to finish a building." It was 55 years ago that the Gospel first came to the Burji tribe in southern Ethiopia. 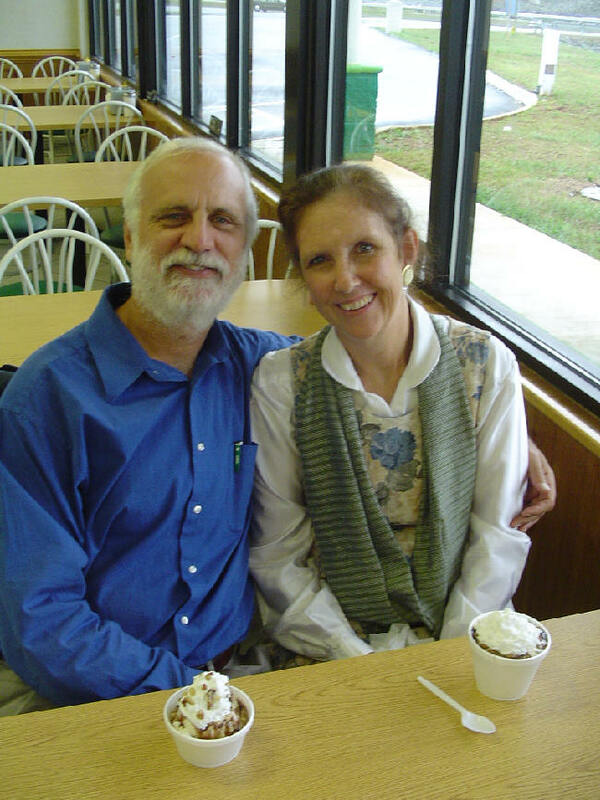 Alex and Teresa Fellows were the first to bring the gospel; they are now probably 80-85 years old and are retired in Florida. (How I would love to have them come up here and spend time with us! What tremendous stories of God’s faithfulness they could tell!) My parents followed them shortly and built on their evangelism by establishing a mission station with an elementary school, medical clinic and Bible school. Our little station was surrounded by barbaric, murderous tribes. But the Gospel spread and soon the Burji people were taking the gospel to these tribes; today they are all living in harmony and worshipping our Lord together. Five years ago, the church in Burji decided to celebrate 50 years of the Gospel by erecting a building large enough for their pastors' conferences and the Soyama town church Sunday services. They did what they could…they put together the mud and stick walls, and put in a cement floor; they tacked on a quick roof to preserve the building, but then ran out of money. The people in Burji are simple farmers, using oxen and wooden tools; their average income for a whole family is about $300/year. They have asked us on several occasions to help them finish the building. At first they, like congregations all over the world, wanted a nice building, with a porch and some decorative stone work. As we looked at Scripture together, they have come to realize that all the fancy stuff isn’t necessary…His Kingdom is people, not a building. So their focus (and ours) is on completing those items that are necessary in order to serve the meeting needs of the congregation. What does this involve? We’ve identified 5 things, and possibly six. Four doors. These must be metal because wood is so scarce; the government has mandated that wood cannot be used for doors. This means that they must be made in the capital city and brought the long way down to the district. The estimated cost in US dollars is $500. Two large windows and 17 small windows. Why do they need windows? To keep the rain out during the 4-month-long rainy season, when it rains day & night, and to keep the thieves out during the entire 13-month year (Yes, Ethiopia’s calendar has 13 months!) The glass and metal windows will need to be brought down from the capital city. The estimated cost in US dollars is $1600. A cement coating on the outside of the mud walls. This is good stewardship of the building. Without this coating the rain erodes the mud, making the building deteriorate more rapidly. The cement must be brought in, but the men of the church can apply the coating. It is a thin coat, so the cement goes a long way. The estimated cost for this in US dollars is $6500. A stable roof. The current roof was erected quickly, without concern for the long-term. It needs some metal bracing, etc. at an estimated cost of $600. Benches. The people sit on long wooden benches. Sometimes these benches have backs, and sometimes not. I’m not sure why the government allows benches to be made of wood but not doors, but I’ve never seen metal benches in churches. The district has written that they need additional benches to fill the “hall”, and they will move the benches currently being used in the Soyama church building to this hall. The price they have given us is quite high (to our thinking anyway…possibly because of the scarcity of wood). When we go in December we are going to further evaluate this. So I will wait until after our trip to finalize this figure. Electric lights. The leaders did not add this to their “must have” list, but we think that electric lights would be good. 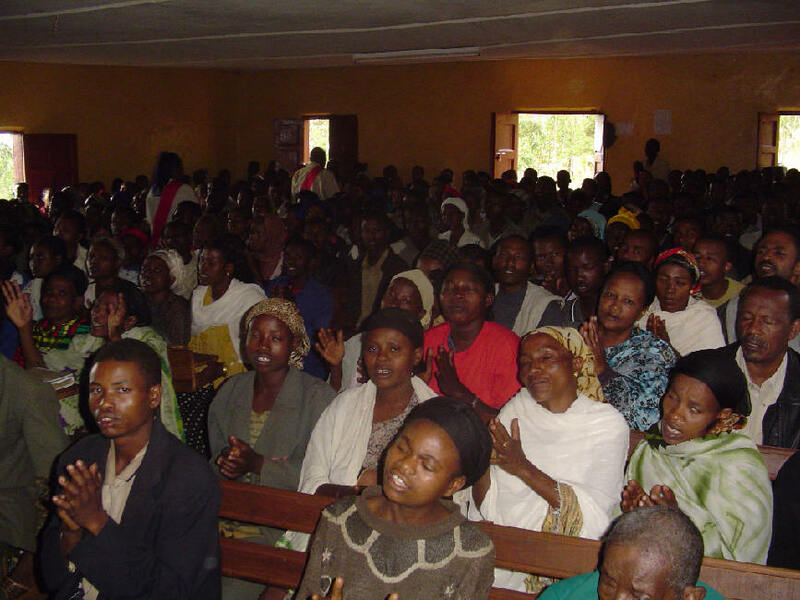 The Ethiopian congregations often meet for extended prayer meetings; these tend to go into the wee hours of the morning! The town of Soyama has a generator that provides electricity for a few hours in the evening. Typical buildings with electricity have a few simple bulbs hanging from the ceiling, but it is enough to aid with reading Scripture, etc. As best I can figure, the cost of this electric work is about $400 USD, but this needs to be confirmed. 1. So that the Soyama congregation can have room for the children; this is crucial in building the next generation of Ethiopian Christians. The Evil One is already trying to destroy the younger generation through the lie of evolution, the lure of materialism and the pride of education. We need to work to unite the children with the mature ones in the congregation; they have a legitimate place in the congregation of the righteous, and they need the influence of the mature ones, many of whom have suffered greatly in the cause of Christ. 2. So that the current Soyama congregation building can be subdivided to make a Christian school. With a few quick interior walls, this one-room building can be made into about 6 classrooms. Office space and bathrooms (an outhouse) are already there; it’s just a matter of the classroom space. 3. It would be a fun project that we could help build. More and more people are asking us about the possibility of going with us on a future trip. Men with experience in electrical work or carpentry could work with the believers there. Teachers could conduct “teacher training” workshops. Pastors & seminary students could go to more distant villages to preach & encourage the Ethiopian evangelists. And we could gather school supplies (chalk, pens, paper, etc.) to get the Soyama school started. It would be a great testimony to the people in Burji of the unity that we have in Christ our Lord. We all need a reminder that geographical barriers are not important in His Kingdom. So my question to you, our dear, loved ones, is this: Will you make it a matter of congregational prayer whether or not to become involved with us in this “wave”? The construction costs are obviously the first need. As you pray, ask Him if He wants you to be involved in funding one or two of the construction costs. Without this funding nothing else can happen. Things move VERY SLOWLY in Africa; it’s just the nature of the beast. And much depends on the weather; only during the dry season (Oct through April) can supplies be brought into the Burji district. We believe firmly that if this is His appointment for us, then He will supply all that is needed in His own time and way. Our job is to wait on Him and allow Him to do His work. For His Kingdom, by His grace, Dave and BeckyLynn Black, Bradford Hall, 2691 White House Road, Nelson, VA 24580, 434-374-0492. Dave again. We truly love these dear people. Here they are praising our wonderful God last November when we visited them in Soyama. I can't wait to see them again. And here is something else cows can do. I finally posted a short piece on the blessings of weekly communion celebration on www.scottbrownonline.com. Thanks again for the encouragement in this direction. For more on the weekly (not "weakly") observance of the Lord's Supper (not "Snack"), kindly stop by our Unleashing the Church page. 6:37 AM I'm always happy to plug a colleague's work, and this book by Andreas Köstenberger will be a worthy read I'm sure. The minister was preoccupied with thoughts of how he was going to ask the congregation to come up with more money than they were expecting for repairs to the church building. Therefore, he was annoyed to find that the regular organist was sick and a substitute had been brought in at the last minute. The substitute wanted to know what to play. "Here's a copy of the service," he said impatiently. "But, you'll have to think of something to play after I make the announcement about the finances." During the service, the minister paused and said, "Brothers and Sisters, we are in great difficulty; the roof repairs cost twice as much as we expected and we need $4,000 more. Any of you who can pledge $100 or more, please stand up." At that moment, the substitute organist played "The Star Spangled Banner." And that is how the substitute became the regular organist. Saying what this pastor said is entirely duplicitous–you load your theology into the lexicon rather than developing it properly, and give your homily a semblance of profundity that comes entirely from misusing Greek and promoting false linguistic ideas. Grab your hankie and read A Somewhat Worse Day at Church. 6:30 AM The presidential race for 2008 is already heating up. I agree with this assessment of my good friend Michael Peroutka's chances. If you aren't familiar with the Constitution Party, DBO has published a few essays on it (just do a Google), including this one. 6:26 AM For you emergent agrarians out there, here's a site I think you'll enjoy. 6:22 AM I am proud to announce that yet another Southeasterner has launched a website. A warm DBO welcome to the blogosphere, James. In the past 2 weeks alone over 805,000 new weblogs were created. Unfortunately, many of these are "splogs" (spam blogs). About a million new blog posts are made each day. For more on the explosive growth in blogging, gohere. ...might I suggest that with the Greek-English Vocabulary that next to each word a chapter reference be given, relative to the chapter when the vocab has been learnt. I found that as I was doing translation in 1st yr that as I looked up words I wasn't sure if I should have known them yet. By putting the chapter reference in the student will see that they should know this word by now and it would act as a continual self assessment whenever translation is being done. I floated this idea past a few of my fellow students and they also thought that it would be a helpful addition. An excellent idea. If you use the book (whether as student or teacher) and would like to offer your own suggestions for improvement, they will be most welcome. You can send them here. My earliest mentors in the field of NT studies, Profs. Bo Reicke and Markus Barth, taught by example the excitement of studying the NT and the importance of maintaining a clear distinction between knowledge and speculation. Despite their accomplishments, reputations, and status as full professors in a prestigious European university, they remained inquisitive, humble, and approachable. I can still remember Professor Reicke talking to me about the topic of NT source criticism, both its possibilities and its limitations. He was fond of stating that scholars should never engage in “group think,” but rather should carefully weigh and examine all issues in a cautious, scientific manner and remember that current knowledge is always partial and imperfect. It was in 1984, while examining a widely used introductory textbook on source criticism, that I had my first glimpse of NT scholars acting as if they had access to some hidden fund of superior knowledge. The extreme confidence that the author and others like him placed in their theories disturbed me. It seemed that there was no room in their minds for doubts and no space for questions. I became wary of the accuracy of their judgments and concerned about the impact of their opinions on future generations of Bible students. When I began to examine systematically their findings regarding Markan priority (a theory that was being promulgated by them as a dogma), it became evident that personal beliefs and subjective theories, especially about the internal evidence (which by its very nature is highly subjective), influenced their conclusions more so than did any verifiable data. I later discovered that my findings were part of a growing body of scholarly literature that, at the time, was being used to challenge the almost patriarchal authority of NT source critics. Later, as I began to do work in the area of NT textual criticism, I tended to accept the “universal findings” and “certain conclusions” of the scholarly guild. However, most of the facts used to support the currently reigning theory in this area seemed to me to be explainable just as easily on the basis of other theories. Again, as I began to publish my findings, I detected an unwillingness or inability to interpret the facts for what they were or to rethink the current consensus. I began to believe what others had suspected for a long time about NT studies: a great deal of what passes as attested theory is little more than speculation, varying widely in plausibility. All of this intellectual speculation probably makes no difference to God. There is no exalted height from which we may survey the truth without first committing ourselves to the One who called Himself “the Truth” (John 14:6). You cannot find No Man’s Land in the divine geography. If we are not for Him, we are against Him. It is impossible to be Neither, Nor. The Word of God does no good unless it is mixed with faith (Heb. 4:2). A critical attitude, ready to find flaws and pick fights, can get no benefit from the Bible. We must believe it and receive it for what it is, letting God be true and every man a liar. This means having a docile and receptive spirit that is ready not only to hear that Word, but to heed it. 7:40 AM Here's a touching story about a fellow New Testament professor who is learning to live with cancer. 7:36 AM It's often a tough call, what with our busy schedule and all, but we still try to participate in a few Civil War reenactments each year. Our final event of the year will be at Fort Branch in eastern North Carolina on November 5-6. We would love to see you there. For directions and a schedule of events, please go here. The venue is secluded and unbelievably beautiful, with a great view of the actual embattlements along the river bluff. 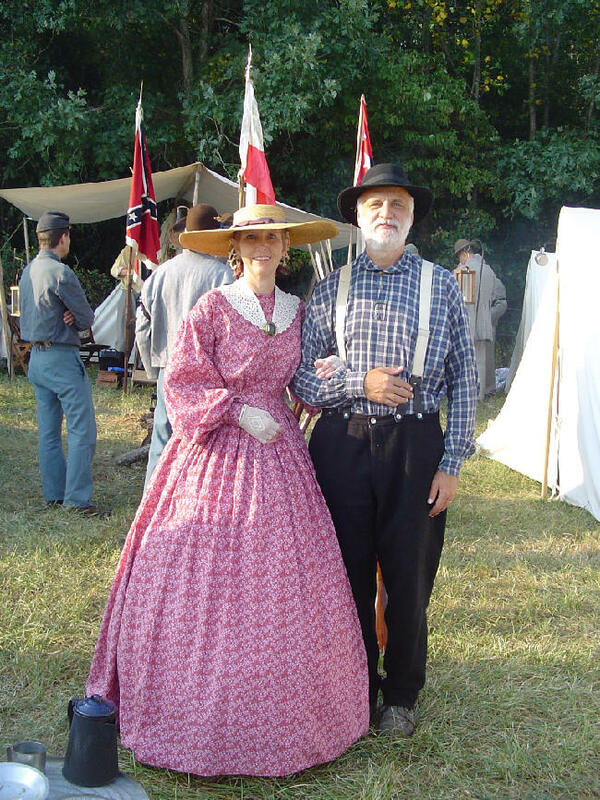 Reenacting is a wonderful family hobby as well as a great mission field. In fact, one of the best reasons to reenact as a Christian family is to share the love of Jesus with people from all walks of life. After all, there were many revivals during the war, and so it seems only fitting that Christ should be present in the camp. 7:30 AM Seven reasons to study New Testament Greek. Pros of Emergent Movement: Holiness, joy, sincerity, community, reverence, honor, liturgy, sacredness, loving the outcasts, missions emphasis. Cons of Emergent Movement: Fear of authority, fear of technology, fear of structure (although they can’t escape any of those three), loss of exegetical teaching, emphasis on feelings and experience over absolute truth, tolerance of sin, socio-political liberalness. 7:17 AM I like using Wikipedia. But is it a reliable source of information? Would you encourage/allow a student to use it when writing a term paper? 7:12 AM Another face of Gaza -- the ancient one. 7:07 AM Had another great Sunday at the Raleigh Chinese Christian Church. 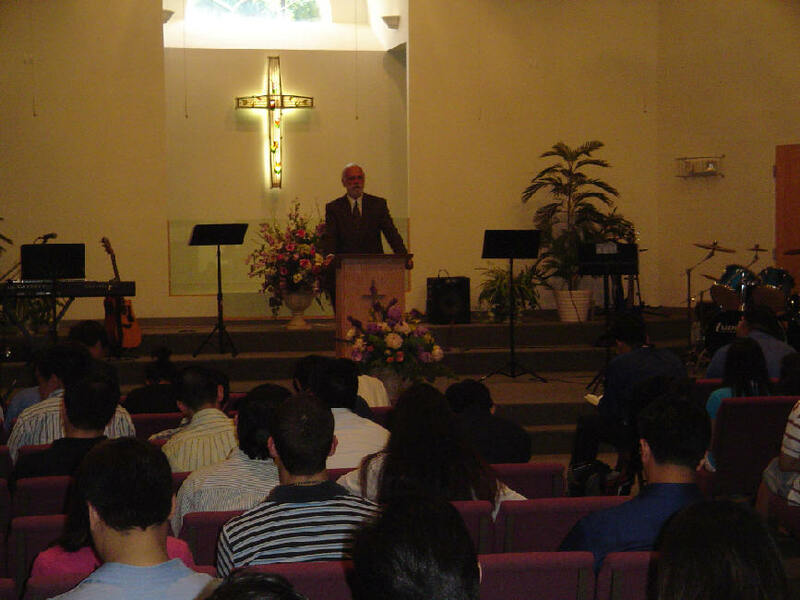 They finished up their missions conference with a combined service (Chinese/English). It had been a while since I spoke through a translator, but the person they used did a marvelous job. Two more families graciously gave us checks for the Ethiopian church, and we had a chance to learn about what their congregation is doing in Asia. One of my favorite times there is the common meal they have after every service. Not only is the food tasty but the chance to meet and talk with interesting people always blesses me and my wife. Becky mentioned to me on the drive back to the farm that this is so much like the early church, which spent the Lord's Day luxuriating in Him and in the fellowship of the saints. I look forward to returning to RCCC in November for a three week series. On another note, it was a beautiful day here in southern Virginia yesterday. Since my son is out of town working on a home restoration project, I have been doing the daily animal chores and loving it as usual. Do you not feel in your own soul that perfection is not in you? Does not every day teach you that? Every tear which trickles from your eye, weeps "imperfection"; every harsh word which proceeds from your lip, mutters "imperfection." You have too frequently had a view of your own heart to dream for a moment of any perfection in yourself. But amidst this sad consciousness of imperfection, here is comfort for you--you are "perfect in Christ Jesus." In God's sight, you are "complete in Him"; even now you are "accepted in the Beloved." If you're feeling unworthy of God's blessings today, take heart. 8:17 AM A fellow SNTS member just sent me this notice. I am happy to pass it on. The revised homepage on the Old Testament background of St. John´s Gospel can now be found under www.erlangen-evangelisch.de/johannesevangelium. It contains new articles in German, (partly also in English, French and Russian) on the Old Testament background of St. John´s Gospel and related topics, not yet contained in the book JOCHANAN, Erweiterte Studien zum alttestamentlichen Hintergrund des Johannesevangeliums 1995, 556p. 7:37 PM I just returned from teaching in Richmond and found my in-box full of emails with links to emergent sites. As soon as I have a chance to review them I will post my thoughts. My thanks to all who wrote. Tomorrow, after speaking at the missions conference at the Raleigh Chinese Christian Church, I plan to take a long rest and then get caught up on my reading. I will respond to your emails as soon as I can. 6:30 AM Looking for an alternative to Halloween that beats "harvest festivals"? Look no further. 6:20 AM I have more and more students wanting to work with me in the field of New Testament Greek discourse analysis, and my file on the subject is growing proportionately. In fact, I must have loaned out that file at least 10 times this semester. Here's a discourse analysis of 1 Corinthians I just added to my grab bag. It's based on research done at the University of Texas at Arlington -- an institution that has turned out a number of excellent exegetes in the past two decades. I think we have Robert Longacre mostly to thank for that -- so "Thank you, Bob." I myself have completed syntactic-structural analyses of 1 Thessalonians, Philippians, and Hebrews, and am currently working on Romans. I look forward to reading this work on 1 Corinthians in preparing for my course on the Pauline epistles next semester. Heartfelt thanks to Ralph Terry for his outstanding work. Όπως πρόβλεπε ο διευθυντής Κρις Τζονς στο Editorial του Ιουνίου, το ομοίωμα του Τουταγχαμόν στο εξώφυλλο προκάλεσε την αντίδραση ορισμένων αναγνωστών. Πολλές επιστολές απηχούν την άποψη του αναγνώστη Τζέφρι Κάρεϊ: «Διαφωνώ πλήρως με την εκδοχή του Geographic για το πρόσωπο του Τουταγχαμόν. Όταν αναφέρετε ότι παραπέμπει σε Καυκάσιο, αποπροσανατολίζετε τον κόσμο». 6:20 AM Being the language lover that I am, I found this report on JFK's German teacher eye-opening. My own German "coach" in California was a former Wehrmacht corporal who had settled in Anaheim after the war. He pastored a small Lutheran Brethren congregation in the city, and I attended the services there to attune my ear to the language. I taught myself the grammar from a book. That was the easy part. But speaking a language is another matter. Paul Mittmann agreed to meet with me weekly for "conversation lessons." Of course, at first he did all the talking -- and the stories he could tell! He had fought in France, in Russia, in Italy, and was finally captured by the Americans in 1945. For a year he and his wife lived under an overturned army vehicle in Schleswig-Holstein, eating "bread soup" (as Frau Mittmann called it). 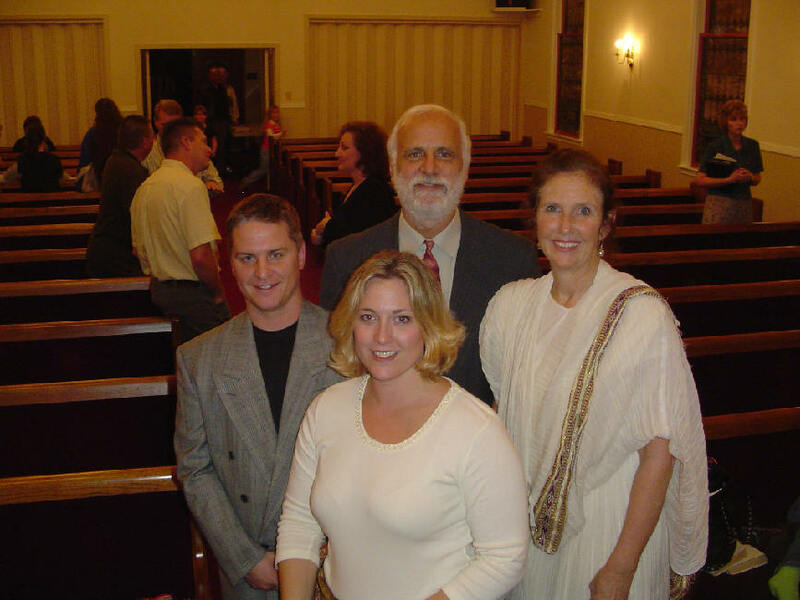 Eventually I was able to join in on the conversation, and before Becky and I left for Germany in 1978 as short-term missionaries with Greater Europe Mission I had had the privilege of preaching four times in his church (in German). Paul spoke the most pristine and perfect High German you have ever heard, and even today when I am in Switzerland people think I hail from Ost-Preussen. Who inspired you to learn German? Was acquiring the language difficult or easy for you? Speaking of German, was JFK's famous one-liner "Ich bin ein Berliner" a linguistic faux pas? (The debate concerns his use of "ein.") Was this "The World's Greatest Gaffe" or "The Gaffe That Never Was"? 6:14 AM The emergent/emerging church is an area I am totally in the dark about. What are the best blogs/websites to read? "I know nothing ... nothing!" Help thou my ignorance! 6:20 AM Suzanne McCarthy has an interesting discussion of Greek orthography and ligatureshere. 6:18 AM Yet another reason to study German: the Internet. ...German is the dominant native language of internet users in Europe. Germany alone has 47 million users. Then when you add in small German speaking countries of Switzerland and Austria you come to over 55 million German speaking users. If you are serious about online business in Europe, the German language is where much of the action is. French is way less than half the German action. Then of course you get spending power and all the German speaking countries have the higher spending power. 6:15 AM Interesting, isn't it, that Nazareth was but a satellite town of the much larger Sepphoris, a bustling Gentile metropolis 4 miles away. I wish I had had the opportunity of visiting its ruins when I was a student in Israel. Here's a neat site with some great pics of the city. 6:12 AM I love to listen to organ music, especially when played on an ancient cathedral organ (like the one in the Basel Minster) or by my son on one of his pump organs. 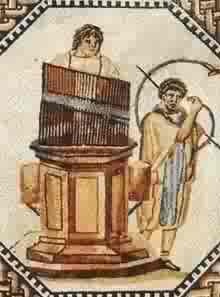 I knew the ancient Greeks were responsible for many inventions, but I never fathomed they would have been the creators of the oldest organ, the hydraulis. 6:03 AM As a huge War of 1861 buff and avid reenactor, I couldn't believe it when a good of friend of mine (who just wrote his doctoral dissertation on Thomas Altizer) told me that “Death-of-God” Altizer was named for a great Southern general. Altizer’s full name? Thomas Jonathan Jackson Altizer. The original Jackson was, of course, a sincere and humble Christian. Sure makes you wonder about people’s namesakes. 6:29 AM "How did you choose your doctoral program?" I have been asked this question a dozen times recently. For me, it boiled down to the answer to several other vital questions: (1) Do you want a seminary or a university doctorate? (2) Do you want to study at home or abroad? (3) With whom do you want to study? (I threw two other considerations into the pot: I wanted to study in a German-speaking university, and I wanted a doctorate in theology, not philosophy.) The first two queries I could answer with ease. I had no desire to acquire a seminary degree. University degrees tend to be more rigorous (and academically competitive). Nor did I want to stay here in the states; a European degree was attractive to me not least because it allows one to focus on research and writing. The question about a mentor was a bit more tricky. After visiting several European universities (all German-speaking) I decided I would either attend Tübingen or Basel. Professors in both places agreed to work with me. Where, then, should I go? I chose Basel for one main reason: Bo Reicke. In my opinion, Prof. Reicke had a perfect blend of humanitas and pietas. Indeed, I dare say it would be difficult to find a scholar in whom the rigor of academia and the humility of personal piety more closely adhered. Thus he became my Doktorvater for three wonderful years. I found the entire New Testament department accessible. My first month in Basel I lived in Prof. Reicke's home while looking for an apartment for Becky and me. I had access to his personal library. I moved into the Birmannsgasse just a few doors away from Prof. Cullmann, who, though retired and aging, often welcomed me into his flat. Ditto for Dr. Barth. What makes a good doctoral program in New Testament? With whom might one study today in this field? I'll have more thoughts on this later. Above Right: The Theologisches Seminar "Zerkindenhof" in the ancient Nadelberg. It was here that I spent most of my time in Basel, researching and writing my dissertation. 6:18 AM “What would Jesus blog?” is a question being raised in cyberspace these days. Indeed, I have often asked myself, “Why blog?” or “What should I blog today?” (Some aresurprised that yours truly blogs, but that’s a post for another day.) Personally, I view my blog (and website) as a ministry of encouragement to the church at large. That is, to the extent that I am called to participation in the church, I am called to ministry, even costly ministry. In other words, I am only a minister. By “minister” I do not have in mind a title of clout and authority. The word minister is not a title of power but a designation of servanthood. I am reminded of what Jesus said to His disciples about honorific titles such as “Rabbi” and “Teacher.” He said, “Don’t be called Rabbi, for one is your Master, even Christ, and you are all brothers” (Matt. 23:8). Of course, this does not mean that I am not a teacher by profession and calling. It means that the basic relationship between me and other Christians is that of brother and brother. I do not desire a “following” – God forbid that anything like that should ever happen! We who minister via the Internet must be careful not to stand in the place of God to other men. I am but a fellow-creature. But as God’s creation I must be where He wants me to be, doing what He wants me to do. But back to blogging. I used to think that ratings and rankings were important. We all tend to emphasize big works and big numbers. Nowhere more than in America are we caught up with the syndrome of size. But this emphasis is not of faith. To think in such terms is to return to the old, self-centered flesh. Not only does God not say that size and importance go together, He even reverses this and tells us to be very careful not to choose a size that’s too big for us (Rom. 12:3). More subtle still is the tendency to make one point of doctrine central. I can reason, for example, that since I am a Reformed Baptist the doctrine of the sovereignty of God is to be emphasized on my website above all. Yes, this doctrine is important to me, but some of my friends have stressed it so much that this dogma, not God, has become the center of their ministry. This can be done with any doctrine or interest we may have. As soon as we do this, it is like a flat tire that makes the whole car bump. KSMilkmaid reminds us that blogging is like singing. If you have a song in your heart it is difficult not to let it come out. Whether you are a good vocalist or a lousy one matters little. Though it is important how we labor for the Lord, our basic mentality should be this: I am by choice a bondservant, and it is my Master who is central, not me. When this is not our mentality we have lost our way, whether the cul de sac involves blogging or some other activity. Jesus said His yoke is easy and His burden light. That’s how blogging is for me. I would like to think it’s because I am co-yoked with Jesus. It is a matter of sharing what He puts on my heart to share. It's just that simple. The Holy Spirit (dare I say it? ), not some supposed inner strength or psychological integratedness, is the source of the overflowing rivers of living waters. The waters are not to be dammed up until they become a stagnant pond. They are to be a flowing river. 6:10 AM Here are the pics I promised of Nathan's chimney project. We almost reached the second storey when this photo was taken. The second phase should go more quickly than the first as the ceiling is lower upstairs. Then it's up through the attic and onto the roof. By the way, our incubator chicks are starting to hatch out. These chicks have already been transferred to a special hutch in the chicken coop, where a mama hen will raise them. 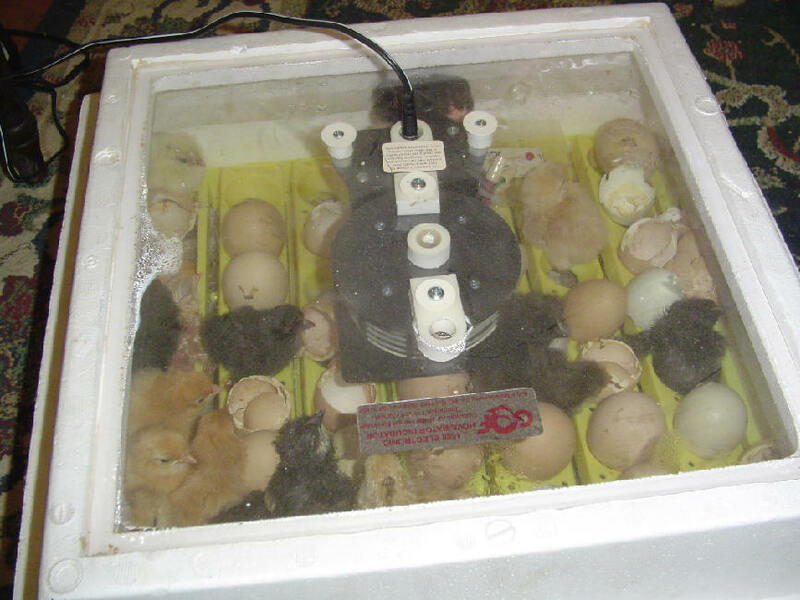 We raise chicks both with an incubator and the good old-fashioned way. Ain't they sweet? 6:49 AM This has been an unusually busy time for me. I have speaking engagements every week plus we are getting ready to spend five weeks in Ethiopia this December-January. I'm also trying to complete a couple of book projects before I meet with the publishers at ETS. 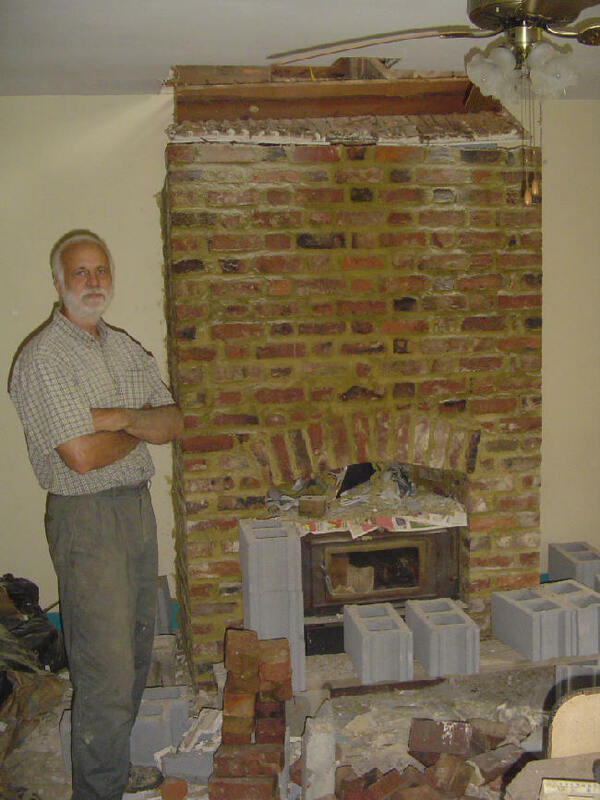 Yesterday I had a wonderful time with Nathan working on his new chimney. I am glad to announce that phase one has been completed and we are now working upstairs. Nate is justifiably proud of his work. The downstairs portion looks great and I know we will spend many happy (and warm) hours there this winter. Our own home has five wood-burning fireplaces but we also have central heat and air, so we light fewer fires when it gets cold. 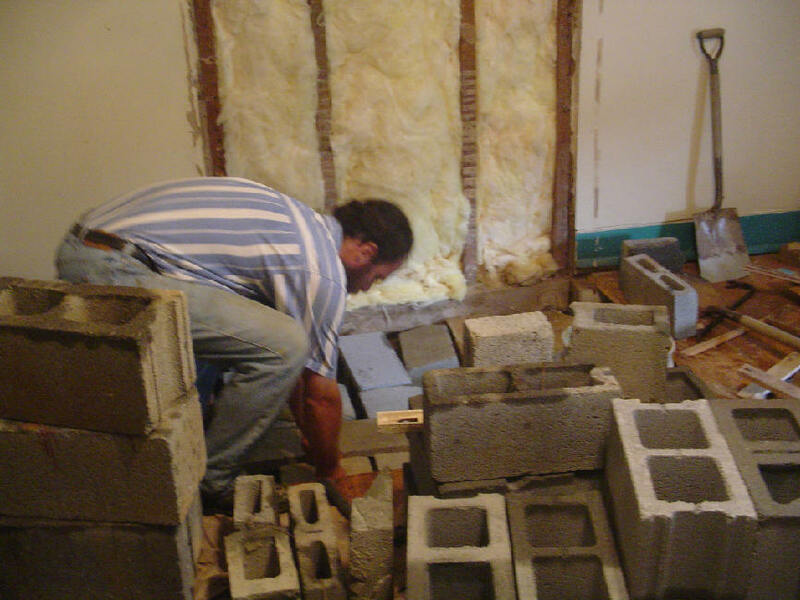 Side note: The lath and plaster we tore down between stories at Nathan's farmhouse indicates that the second story was built later than the first. We guess that the first story was completed no later than 1850. 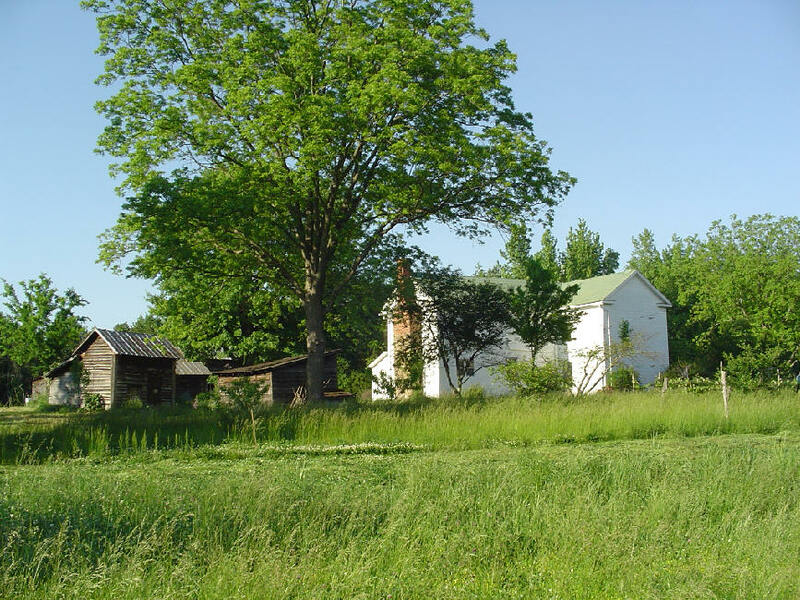 The front part of his house dates to the 1790s. 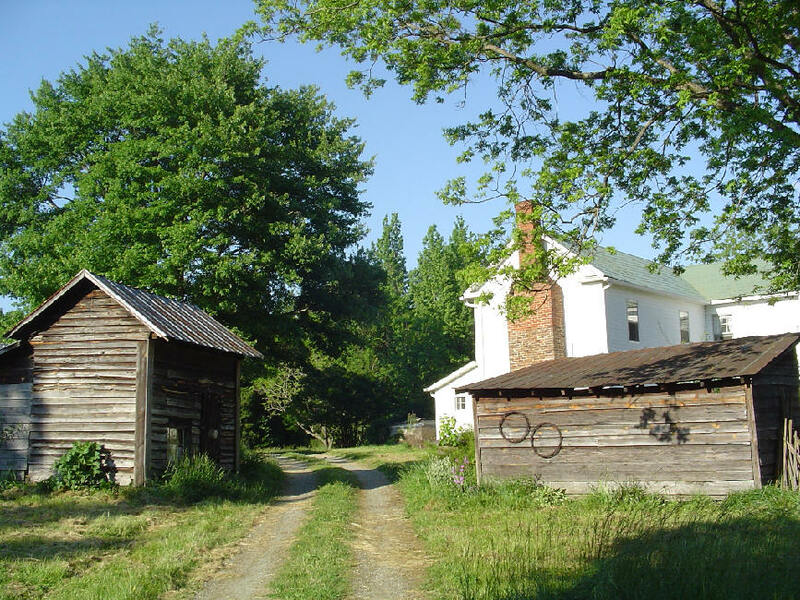 Below is one of my favorite views of "Maple Ridge," Nate's farm. 8:46 AM Once again Izzy shows herself to be on top of the homeschooling news with a link tothis great post about a NC lad. Phenomenal! 7:55 AM Latin Proverb for the Day is a nice site and will help you keep up with your language skills. I still consider Latin indispensable for New Testament studies -- textual criticism, early Christianity, New Testament theology are just three fields where a knowledge of Latin is a must. As I've mentioned before, my graduation ceremony (such as it was) at the University of Basel was in Latin, and I swore my doctoral oath in that language (while placing my hand on a 13th century sword). Of course, if you want to learn a modern Romance language, Latin study makes a superb foundation. 7:46 AM I don't know how I missed this, but the world recently celebrated Hangul Day. I believe it was on my third (or possibly fourth) trip to Korea to teach that I learned how to read the Korean script (한글). Being a phonetic alphabet it's actually quite easy to learn. I even picked up a few handy phrases (e.g., "Where I can eat some Kaegogi?") that impressed the gullible. I met several American missionaries there who were quite fluent in the language, which, like German, has the reputation of being spoken and written backwards (the verb always has sentence final position). You can give it a whack here. 7:37 AM A Day in the Life. For what it's worth, here are some photos we took yesterday. I suppose they represent a "typical" Sunday in our life. In the morning, we had the joy of teaching on Acts 17:1-11 at the Raleigh Chinese Christian Church. This is the English Service attended mostly by high schoolers as well as Duke and NC State students. A sharp group! After an afternoon nap we took a long walk through the farm, stopping first to see how the growth on our newly cleared land was doing. We seeded this field in alfalfa, clover, orchard grass, and fescue. The Lord provided the rain, and voila! We just graduated Harry from the calf stalls to the mini-pasture to get him started on grass. Here's Little Miss Sheba checking him out. 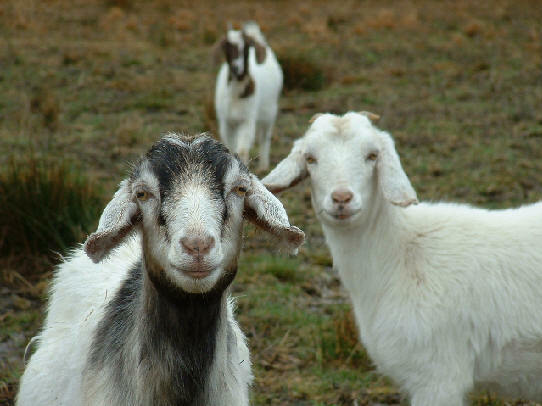 The goat herd is always eager to see us. 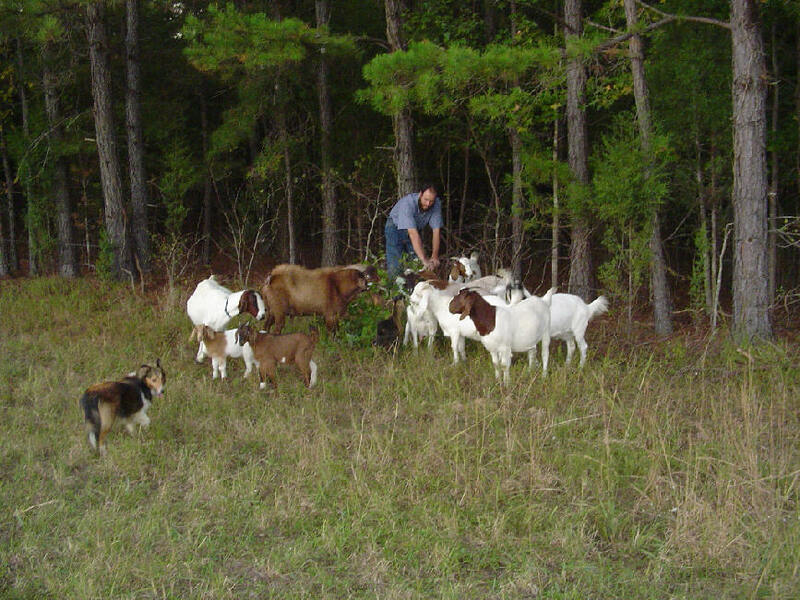 Nathan enjoys giving them some delicious leafy fodder. 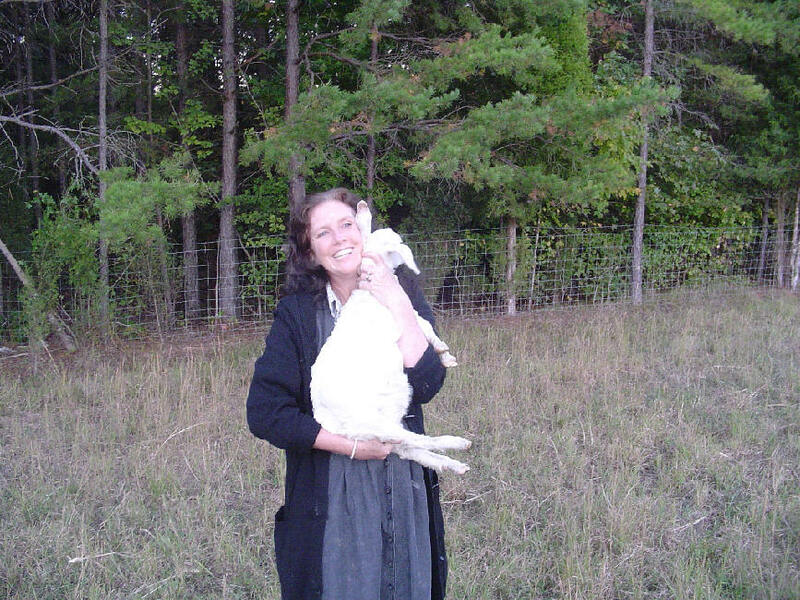 Here's Becky loving on our little orphaned Snowball. Then it was daddy's turn. 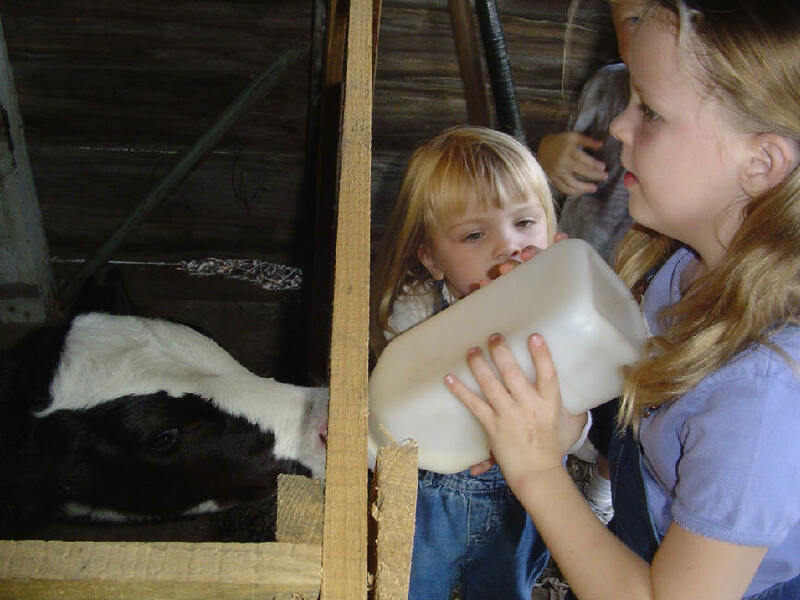 It's amazing how friendly bottle-fed steers are even when they're grown. Bert (left) was the one we hauled out of the pond last year after he had been mauled by some hunting dogs at about 3:00 in the morning. In about a month he will be in our freezer. Then it was back to Bradford Hall where Becky canned apple sauce and Nathan and yours truly read in their favorite room, the library. Needless to say, we enjoy farming. It's a difficult but satisfying lifestyle. We have both practical and biblical reasons for living off the land. If you're interested in learning more about agrarianism, Chad Degenhart's essays are a worthwhile place to begin. 7:26 AM My Greek students will (I hope!) be able to tell me where this extreme lexemecomes from. David Allen, The Authorship of Hebrews: The Case for Luke. Dave's a good friend of mine who once had me teach for two weeks at the Criswell College in Dallas when he was heading up the homiletics department there. Now he's the dean at Southwestern's school of theology. My guess is that he'll be rehashing the arguments he used to try to prove direct Lukan authorship when we debated the issue back in 2000, during our Symposium on New Testament Studies at Southeastern. Wayne Grudem, Why Do Poor Nations Remain Poor? Economic Causes and Biblical Solutions. Anyone who knows my interest in Ethiopia will figure this one out. David Lowery on Mark and Paul on Human Weakness in Spiritual Formation.This is another obvious choice given my work on astheneia and its cognates for my Basel dissertation. 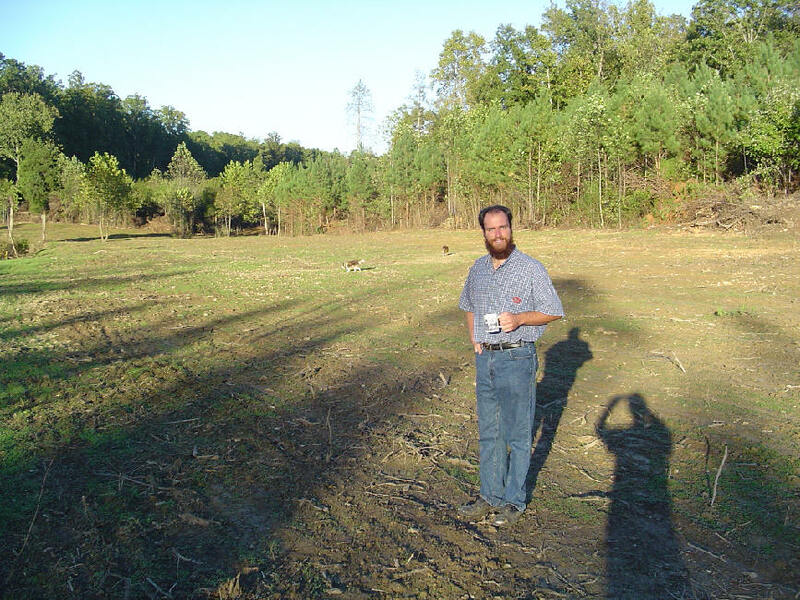 Randall Buth, The Sower: Using Hebrew, Aramaic and Greek to Read a Parable Synoptically. Randall and I roomed together at SIL headquarters in Dallas during a two-week symposium that resulted in this book (to which Randall contributed). He lives and works in Israel and was also at the Jerusalem University College when I studied there. Should be an interesting approach to parable interpretation. By the way, students, your Greek prof reads his Hebrew New Testament several times a week (yes, he said Hebrew New Testament). It is a most helpful tool, especially in the Gospels and the early chapters of Acts. Leslie Keylock: Q, Mark, Luke, Matthew: The Current Order of Synoptic Development? I guess the operative word here is "development." It's interesting that he is still talking about "Q" and not "Qs." By the way, I am highly suspicious of any approach that ignores the external evidence. John Warwick Montgomery, Slavery and the Gospel. I don't care what topic he's lecturing on, I love listening to John. Ward Powers, A Linguistic Reassessment of Some Areas of Greek Morphology.Ward has been the leading popularizer of morphology in Greek pedagogy in recent years. If he's reassessing the field, maybe we're all in trouble. John Hammett, An Ecclesiological Assessment of the Emerging Church Movement. I am a complete ignoramus in this area. Abidan Shaw, Walter Bauer and the New Quest for the (Un)historical Text of the New Testament. What a title. But with "Bauer," "Quest," and "Text" in the same utterance it has my attention. Abidan is my former teaching assistant and a current Ph.D. student at Southeastern. Rick Brannen (of Ricoblog fame) on New Developments in Computer Tools for Teaching and Research in Hebrew and Greek Syntax. Sounds like this will help all of us move away from word-bound exegesis and focus on larger syntactical units. 7:00 AM Mailbag update. Here's a kind letter in response to our essay Is It Too Late For America? Good article. I have a brother that shares your name and stumbled onto your site. I think a little persecution is actually good for Christians as distasteful as it sounds, it is probably God’s way of strengthening us for really bad stuff and culling the herd if you well. Nobody likes to be persecuted but then again exercise isn’t always fun either. Your latest article "Back to the Bible!" prompted me to write, as you are echoing my own thoughts and advice to a young pastor of my acquaintance.... What a danger it is, as we begin to appreciate the godly men of old through their writings, as well as those who are living, and to begin to idolize them and seek to become carbon copies of them. It's so easy to read their works and sermons at the expense of our time in the Scriptures. I thank God for your pages on the web. Yours in Christ Jesus, J. G.
This letter remarked on the photos we posted about our Student Day here at the farm. 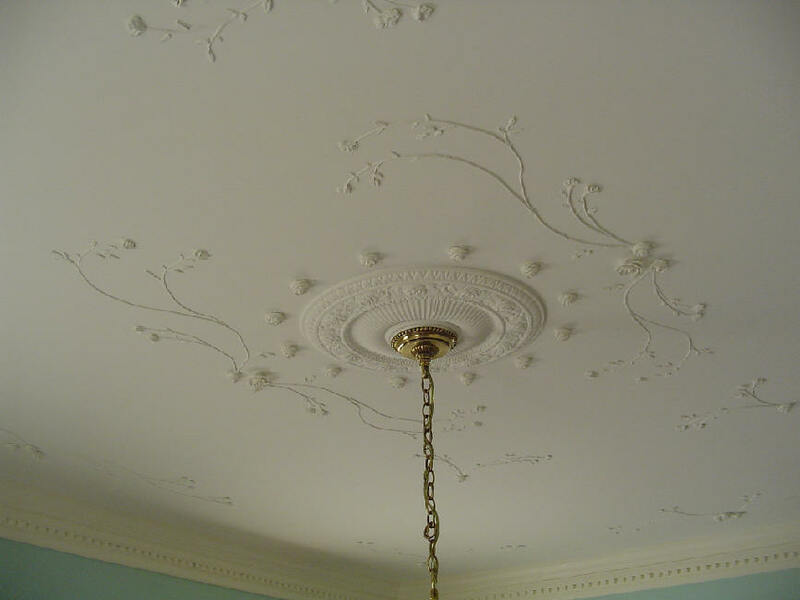 Please tell Nathan that that is the most beautiful ceiling I have ever seen! Every time you post pictures of his work (furniture, buildings, organs etc) I am utterly amazed. He is very gifted. A big DBO "Thank You" to everyone who takes the time to write us. 9:14 AM Yesterday's Student Day was filled with food, fun, and fellowship. I heard many interesting conversations about homeschooling, courtship, missions, and discerning God's will. I praise the Lord for all of my students and their passion for following the Lord Jesus wherever He leads them. 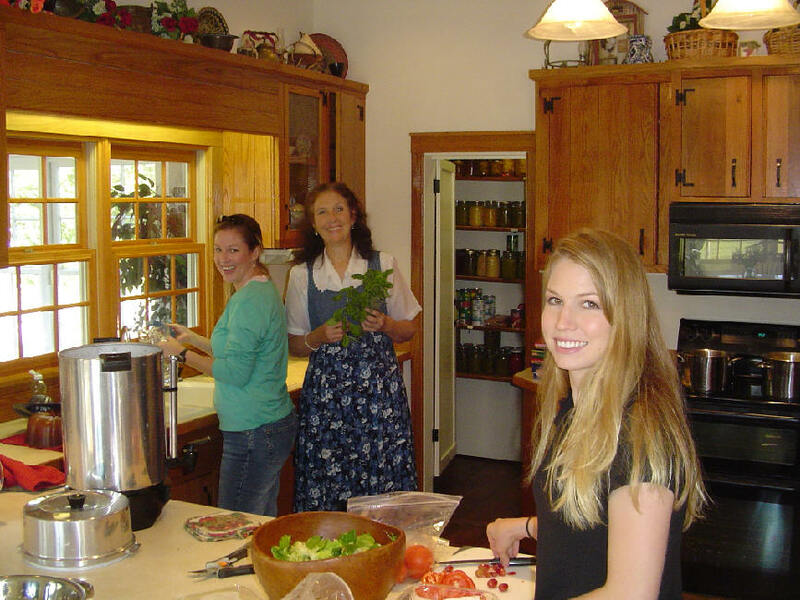 Becky was ably assisted in her preparations by two of my Greek students, Holly Rusher and Anne Marie Hofmeyer. 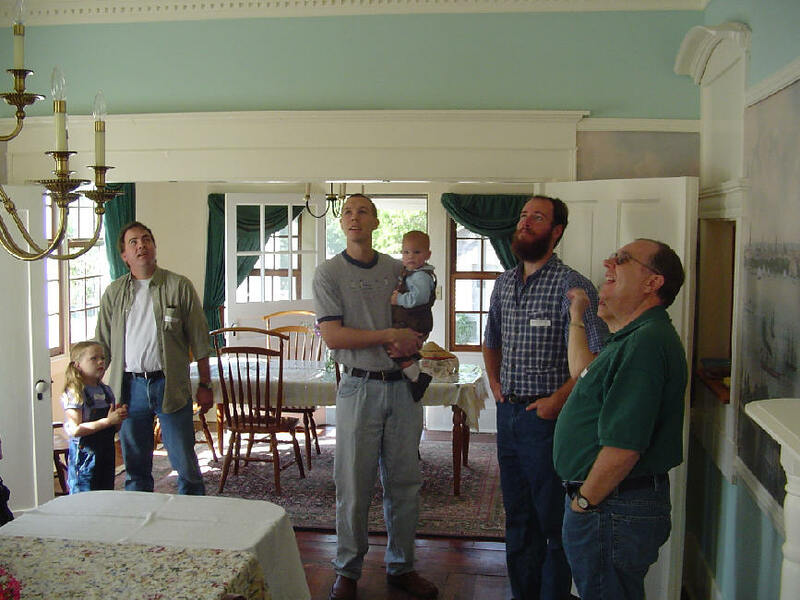 Nathan gave several tours of Bradford Hall, the house he designed and built for us. Here he is in our formal dining room. And here's what everyone is gazing at. 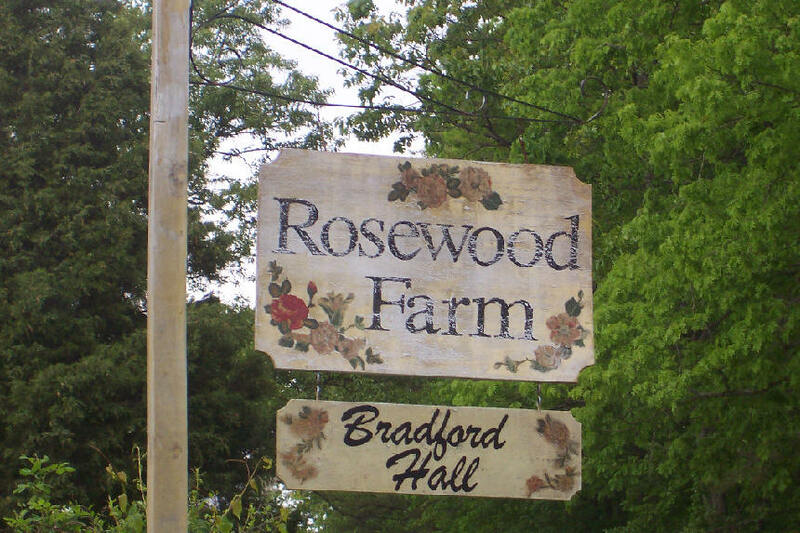 Since our farm is called Rosewood, Nathan used a rose theme throughout. 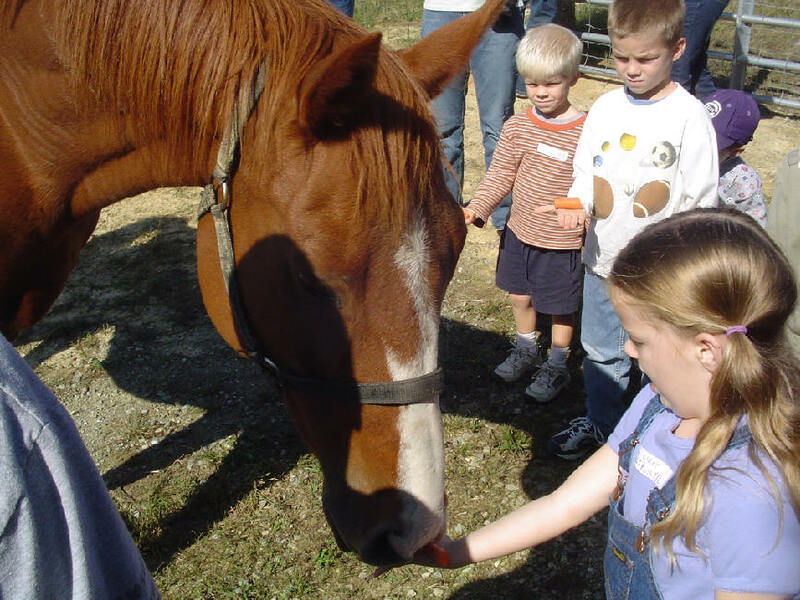 For many of the children it was their first time to feed a horse. After being taught how to safely hold a carrot the children patiently awaited their turn to feed Traveler. Our baby calves still need bottle-feeding, and we had no shortage of volunteers to help us. 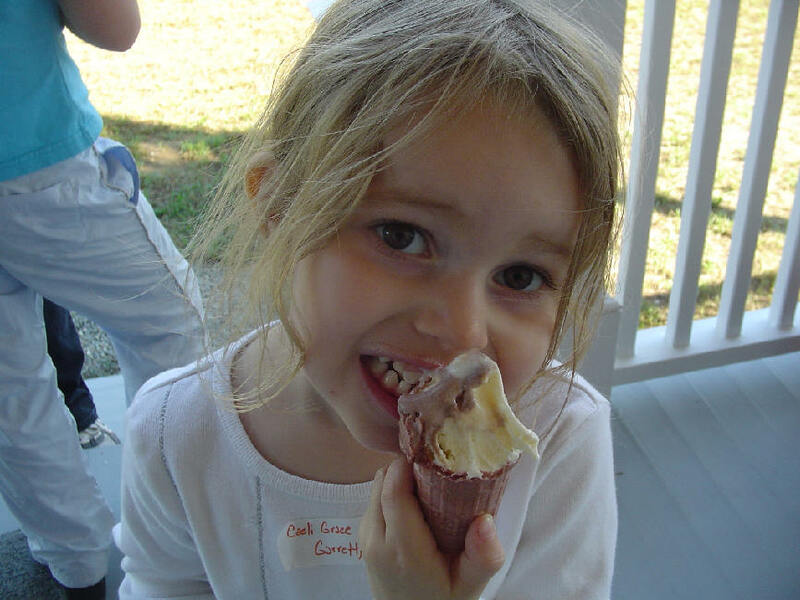 Our menu was Italian cuisine, topped off with ice cream cones. 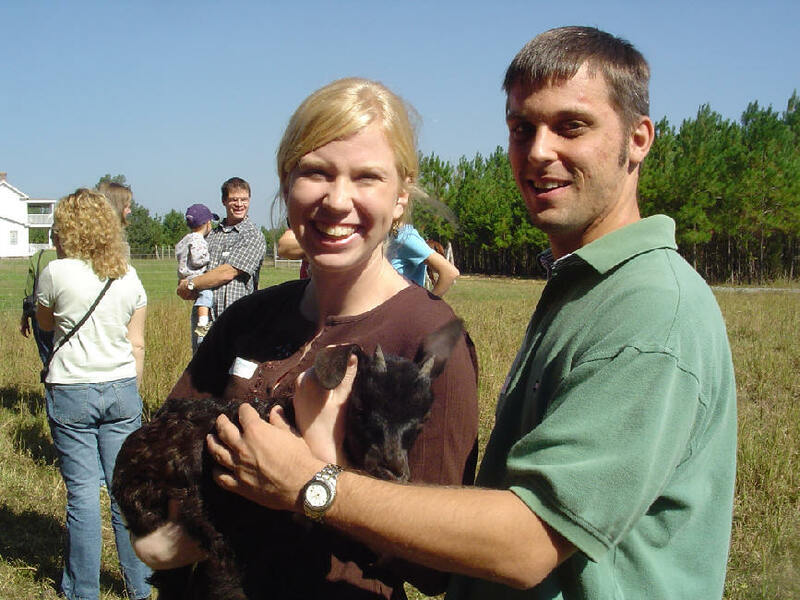 Here Courtney Bryant and Michael Sexton enjoy holding our orphaned goat Midnight. Courtney and Mike are engaged to be married. Their big day is scheduled for June 9, my birthday. Congratulations you two! 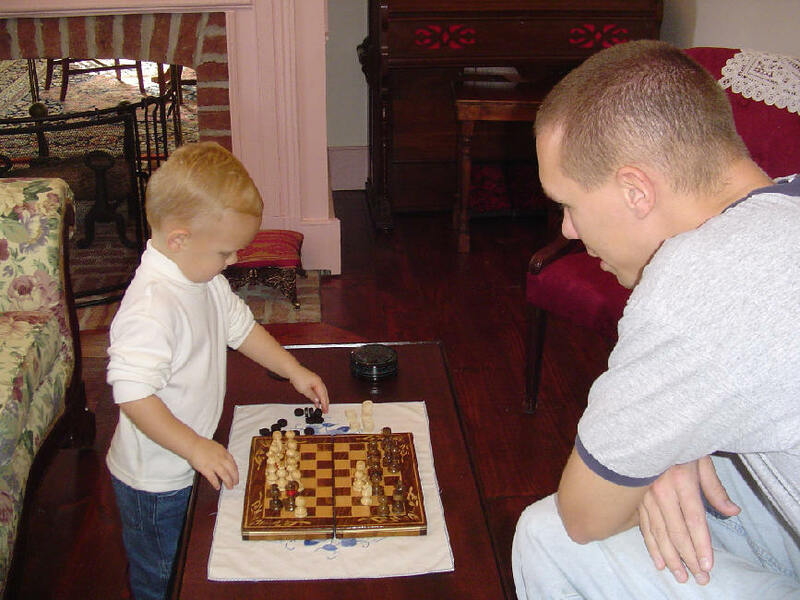 Matthew Rondeau and son engaging in a game of chess. One of the main reasons we have these get-togethers is for the children. Too many look back on their dad's seminary experience with sadness. We want them to have many happy memories. We had a wonderful time. These are some of the most precious families you will ever meet. A love offering was taken for Ethiopian Bible School students, and we will carry it to Africa when we leave on December 13. 7:35 PM Today was the big event -- Student Day at Rosewood Farm. We enjoyed picture perfect weather and a great turnout. Photos soon. God bless you all. While God the Father praising. 7:10 AM I'm encouraging all of my Ph.D. students not just to learn German but to master the language. It's really not that hard once you've mastered Greek. Then when you see a term like "elefantastich," you'll be able to tell whether it is real German or just another crazy example of Net-speak. Here are some good online resources for nailing your German. I suppose the best bodysurfing I've ever done was not in Hawaii (where I grew up) but in Israel, of all places. Ashkelon was breaking about 10-15 feet and it was a red flag day (meaning no one was allowed in the water), but I talked the local Israeli lifeguard into turning his back while I caught a few big ones. Why the pass? I told him I was a lifeguard from California (which I was). That summer I also bodysurfed the Sea of Galilee. We were staying at a youth hostel in Capernaum when one of those infamous lake storms arose. 6:58 AM Wayne Lehman of the Better Bibles Blog has an excellent post on the ins and outs oftranslating chiastic structures in the New Testament. Y'all need to check it out and think through the issues Wayne raises. As you might guess from reading Wayne's comments, it's a topic the ISV Committee on Translation did not see eye to eye on. 6:55 AM Today I will be on campus to sit on a faculty panel answering questions from prospective students. If you are visiting the seminary, a warm welcome to SEBTS. I look forward to meeting you and answering any questions you might have. 6:51 AM Just a quick farm update. I was so busy this week at a revival in Roxboro that I didn't have a chance to check up on my animals. Last night I rectified this grave deficiency in my daily routine. I am happy to report that our orphaned goats (Snowball and Midnight) are growing like weeds and that our new calves are adjusting to their stalls. Isaac (calf) seems to be recovering nicely from a bout with pneumonia, while Sheba (Sheltie) may well be pregnant (she seems a bit calmer than usual). 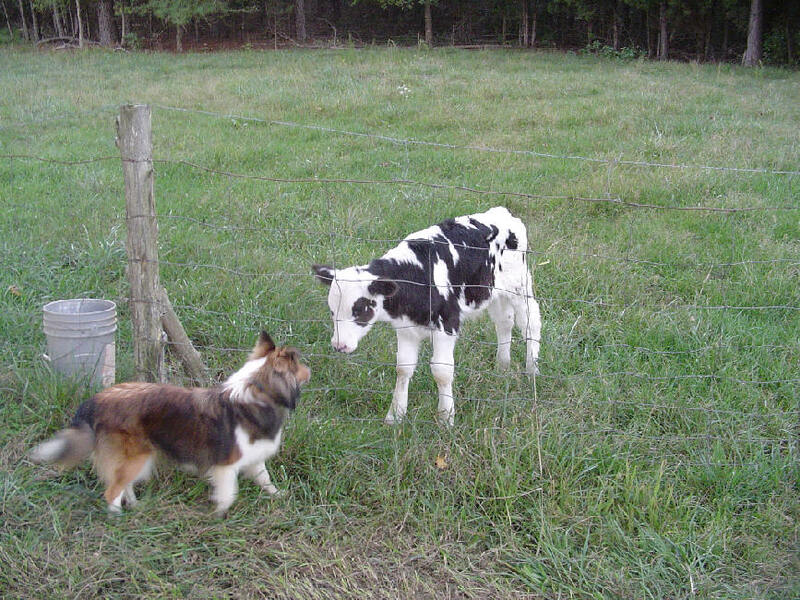 Both puppies were glad I took them romping through the fields, and we even paid a visit to Traveler (horse) and Bert (steer). Nathan has been mowing the grass in preparation for Saturday's Student Day, while Becky has been doing a wonderful job of painting the front porches. The weatherman is calling for sunshine and temperatures in the low 80s -- perfect for a country get-together. Life on the farm, after four years, remains as busy and satisfying as ever, and I don't think any of us would trade it for the world. 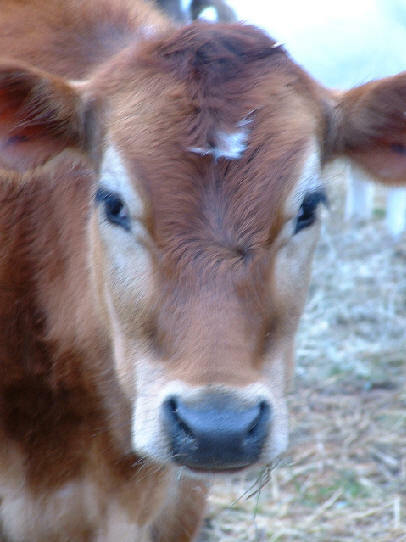 O yes, we also welcome to Rosewood Farm our latest calf, Karl (der Grosse). 6:46 AM What think ye? Link. 6:40 AM Matthew Narramore was kind enough to send me not one but two copies of his book,Tithing: Low-Realm, Obsolete, and Defunct. Thank you, Matthew, for your generosity. Matthew also has a website. 7:35 AM Cedarville University has just announced an opening in Bible. 7:31 AM Thursday morning shout-out to Jason and Molly Evans for hosting us at their annual revival at Bethel Hills Baptist Church. What a wonderful week we've had. Last night we experienced a great outpouring of the love of Jesus as the congregation laid hands on us and prayed for our upcoming trip to the villages of southern Ethiopia. These precious saints of God contributed $1,098.86 to the work of reaching Muslims and others for Christ. Thank you, dear friends! 7:26 AM My gratitude to Russell Kelly for sending me a copy of his book, Should the Church Teach Tithing? 7:24 AM The latest addition to our home page is called Back to the Bible! 7:23 AM The Australian Bible Society is now featuring a translation into SMS language. 7:20 AM Tolle, Blogge has an interesting link to the Willow Creek philosophy of "adult" worship. 7:15 AM Kudos to a Southeastern student who has his priorities right. 7:12 AM Over at Talbot School of Theology Alan Hultberg has a nifty chart for anyone who'd like to read their Greek New Testament in a year. 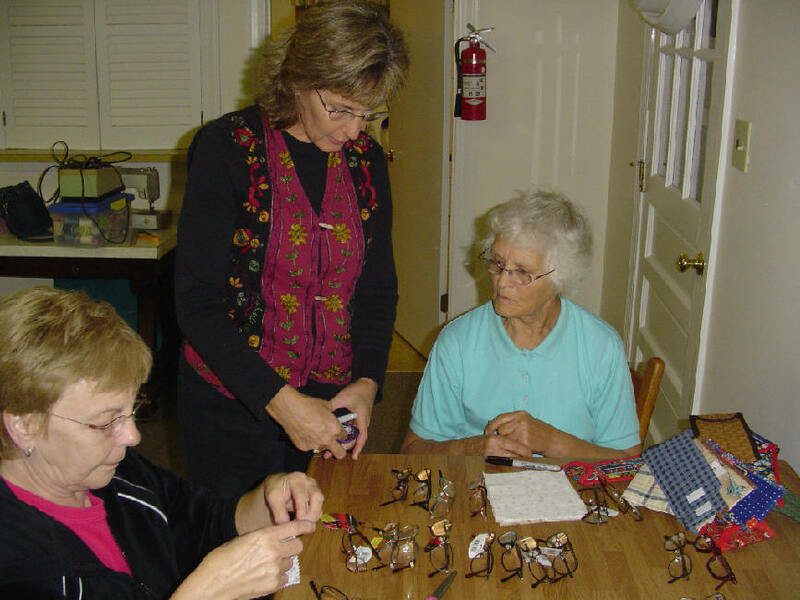 7:10 AM On Monday night Mrs. Janie Cutts (wife of pastor Doug Cutts of Norlina Baptist Church) organized a sewing party to make cases for the eyeglasses we are taking to Ethiopia in December. I can already see the joy and excitement on the faces of countless elderly Ethiopians when they can read their Bibles again. Thank you, Norlina Baptist Church, for your labor of love! 6:31 AM Let's keep on praying for Jay and household, who thankfully are on the mend. The Web is not about building personal kingdoms but about building trust and relationships, despite its somewhat impersonal nature. It's a place to be transparent, a place where the Body of Christ can bear one another's burdens and so fulfill Christ's law of love. 6:30 AM This is kind of cool. 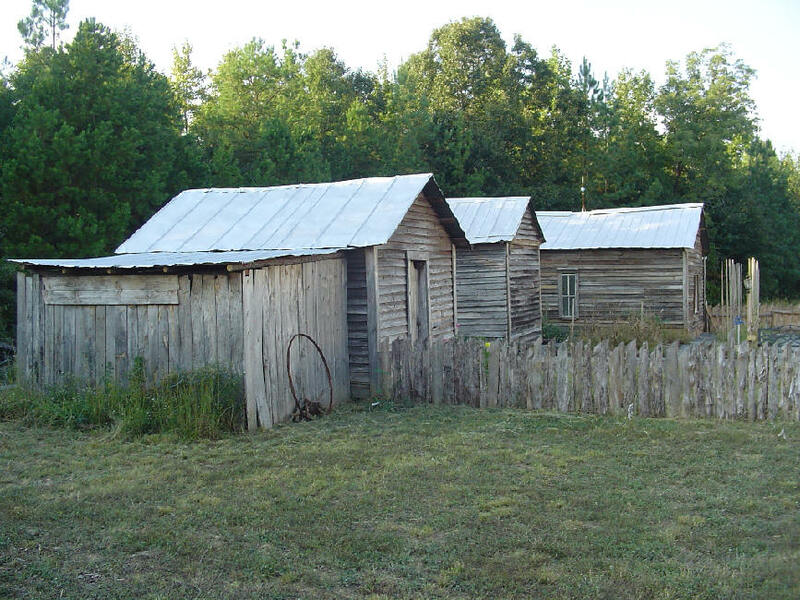 I searched for "Rosewood Farm, Virginia" on Google, and this is what I found. 6:27 AM Memphis Theological Seminary is looking for a Ph.D. in New Testament to teachBiblical Studies. 6:25 AM Our revival at Bethel Hill Baptist Church winds up tonight with a mission's emphasis. 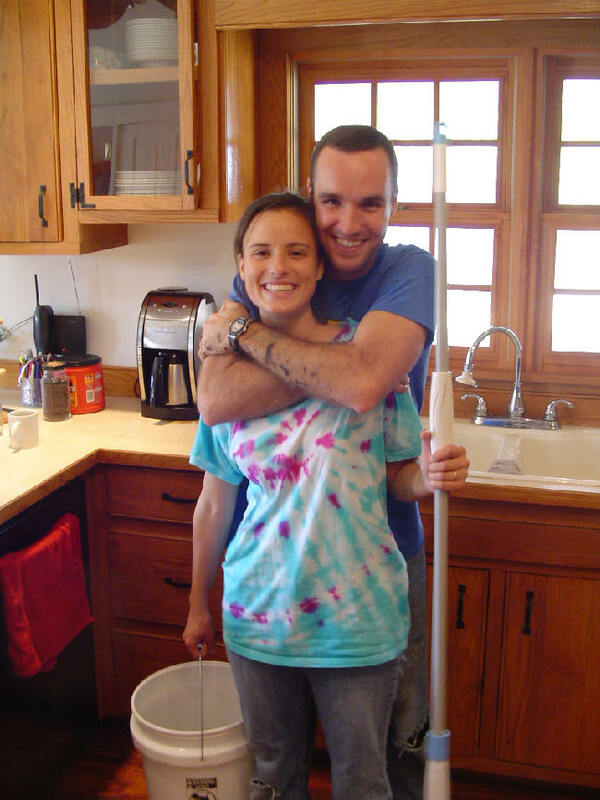 Becky will be sharing about our work in Ethiopia and I will bring a message on missions. Our previous messages were: Jesus and the Age 30 Transition (Luke 3:23); Jesus and the Age 12 Transition (Luke 2:42); and The Gospel according to Four Women (Matt. 1:3-6). Last night Nathan played his pump organ magnificently. 6:21 AM Matthew McDill has posted a brief but insightful review of Harold Hoehner's commentary on Ephesians. Harold and I share a love for this (Pauline!) book as well as an ability to speak Swiss German with each other (did you know that Harold is a Swiss citizen?). The best thing about his commentary, in my view, is it's down-to-earth style; Harold calls 'em like he sees 'em, and he usually calls 'em right. 6:18 AM In 1983 I made a "Zwingli-Reise" to visit the major sites in the life of the Reformer of Zurich, from his birthplace in Wildhaus to the battlefield at Kappel where he fell. Yesterday was the anniversary of Zwingli's death, and I am glad to see that I wasn't the only one interested incommemorating it. My own Anabaptist forebears were persecuted by Zwingli for insisting on a Believer's Church and Believer's Baptism, and the issue has not gone away since. I would agree with Zwingli that communion is a memorial and not a sacrament; yet just as Zwingli couldn't join forces with Luther over the issue of communion, so the Anabaptists couldn't join forces with Zwingli over baptism. These debates continue today and are important to reconcile in one's own mind based on one's best understanding of the Scriptures. God grant us both clarity and charity! 6:12 AM This is more bad news for Ethiopia at a time when the nation desperately needs political stability. Becky and I were in the capital last June when the protesters were killed and we heard the gun fire just outside the place where we were staying. Let us all pray for the peace of Addis Ababa. 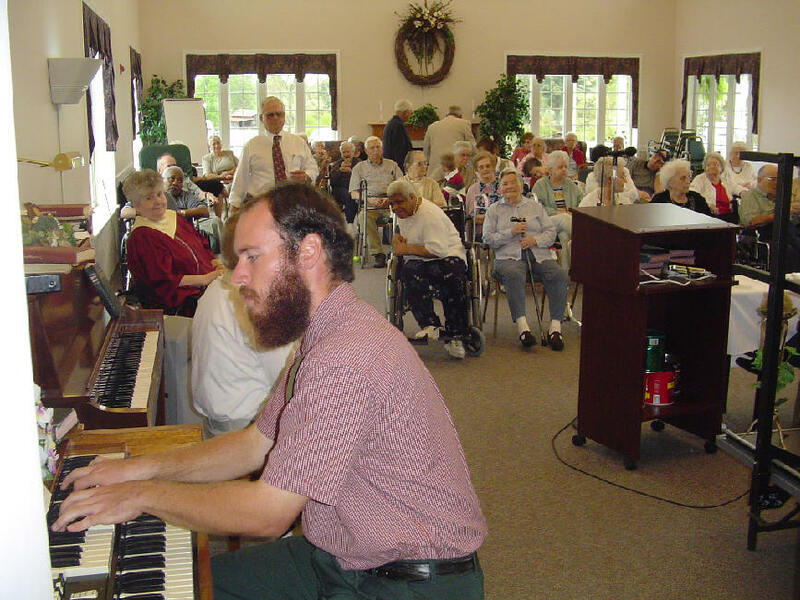 8:18 AM One of the greatest blessings in our family is to visit the local nursing home. On our way to town last Sunday afternoon we stopped by the convenience store and splurged on a sundae. Doesn't my Becky Lynn look beautiful? 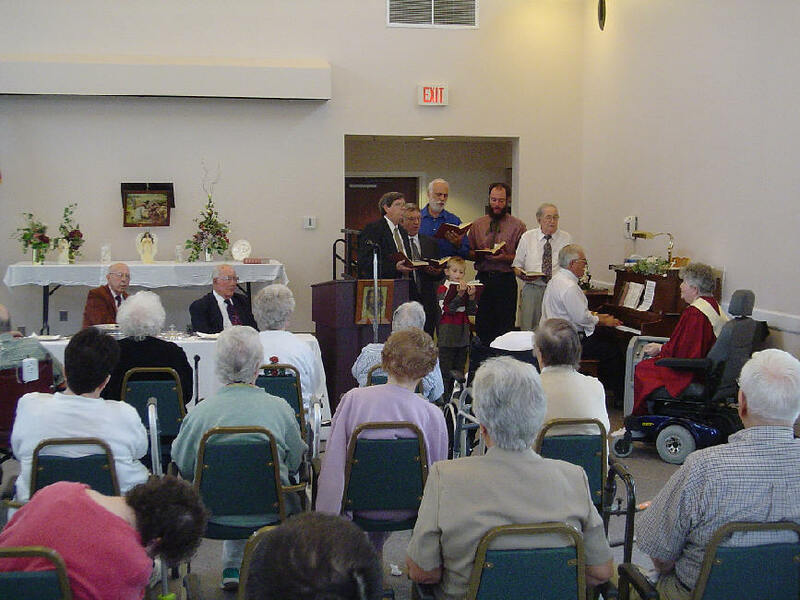 Both our church choir and our men's group (below) sang for the communion service we hosted. Man, do we love Country Gospel or what? As the bread and cup were being served, Nathan played some of the great hymns of the faith on the organ. 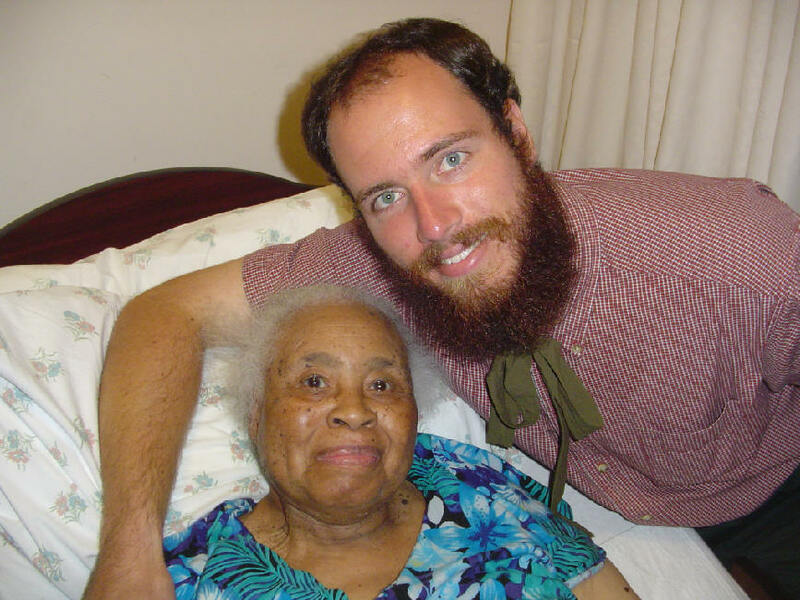 Here's one of our favorites, Miss Davis, whose ministry is praying for others, including our family. She is a gem. She was ill on Sunday so we brought the elements to her in her room. 8:12 AM Not that this is necessarily earth-shattering news, but it looks like Gerhard Schröder has fallen on his sword and Lady Merkel will become the next German chancellor. She will be in charge of a "grand coalition" between her Christian Democrats and Schröder’s Social Democrats. If you read German I double dare you to open the preceding links and read the philosophies of these two parties. If you do, you will be forced to agree, I think, that they are two wings of the same bird of prey, to paraphrase what Pat Buchanan once said about our own Democratic and Republican Parties. It appears that the Social Democrats will get eight ministries in Germany’s new government (including foreign, finance, work, health, environment, and transport), while Merkel’s "conservatives" will get only six (including industry, education, and family). I am sure the Germans will find new ways of expanding "socialism" as a result of this election, but at least they'll be forthright about it. 8:10 AM Meet the largest salmon on earth. 8:06 AM Decision making in the church today. I thoroughly enjoyed briefly perusing your website along with inspecting the contents of your biographical sketch. In recent days, I have had the express privilege of reviewing some of your notes on textual criticism, especially in reference to the variant reading in John 3:13. Notwithstanding, I currently have one of your Greek grammars on order to glean from as well. However, I'm drafting this brief email in the hopes that you will take a few moments and kindly relay to me your position as to the variant reading in Luke 4:4. Do you believe that the phrase, "but by every word of God" should be considered original, or do you adhere to the proposition that it is a meaningful interpolation due to an assimilation to Matthew 4:4? I eagerly anticipate your response. Sincerely in Jesus Christ, J. N.
8:05 AM I almost forgot. A hearty welcome to Isaac and Jacob -- our latest calf additions here at Rosewood Farm. They are 6 days old today. 8:03 AM Over at Still Reforming, Matt Gum is suggesting that we read our church doctrinal statements. While everyone may not want to study theology, everyone should know not only where they stand on important Bible topics, but where their church stands as well. 8:00 AM You shouldn't miss Darrell Dow's recent blogging about the Wee Emperor and his "war on terrorism." Now, it seems, what's really ensured is a "democratic" government in Iraq that will enforce Islamic Law and create an Iraq-Iran superpower in the Middle East. 9:08 AM Just a reminder: Next Saturday from 10:00 to 5:00 is our Student Day here at the farm. We average anywhere from 75 to 175 people at this event. My wife and I are looking forward to meeting many of you then. Our menu this semester is Italian Cuisine. 9:03 AM Last evening, while driving the back roads near our farm trying to round up some stray dogs (ours), I happened upon a fallen tree. It blocked the road completely and I knew that there was only an hour until dark. Unless that tree was taken care of then and there, someone was in for a very rude surprise later that night. (No, there aren't any rum runners in our neck of the woods any more, but people still drive as if there were.) So what to do? Call 911? Call the Sheriff's Department? Call VDOT? Actually, I thought about doing all of the above. Then another thought occurred to me. Why not just take care of it myself? So back to the farm I went to pick up my son and our trusty chain saw, and within five minutes we were tearing into that huge hickory with a vengeance. While we were working a state employee arrived (he'd been called in by a 911 phoner) with the dullest chain saw you ever saw. He shore was glad we were there to help, to say the least. 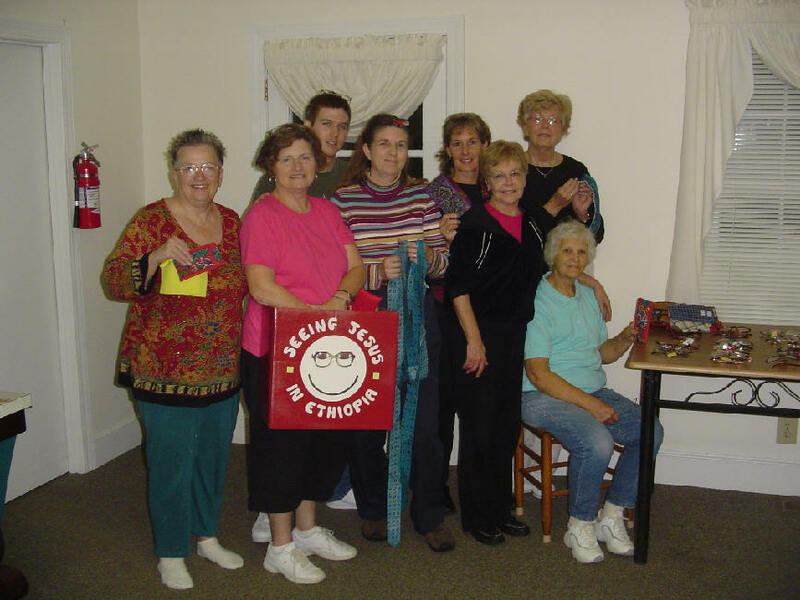 Having taken care of business we went on with our activities and I thought to myself, I love being part of a community where folk take care of each other. 9:00 AM Here are the speakers for this week's GodBlog convention at Biola University. I note with disappointment (but not surprise) that nobody from The Backwater Report is featured. 8:54 AM Tonight kicks off our revival services at Bethel Baptist Church near Roxboro, NC. If you would like to attend our meetings (which run through Wednesday), email me and I will be glad to send you directions. 8:50 AM One of the peculiarities of Aramaic compared to its sister languages is that Aramaic puts the definite article ­– the word meaning “the” – at the end of a word instead of at its beginning. So if you take the word keph, meaning “rock,” and add the article ­– simply the syllable a – you get kepha, “the rock,” which also happens to be the original Aramaic name of “Peter,” the nickname of Simon Bar Jona. It shows up in English bibles as “Cephas” (e.g., I Cor. 1:12). Read Learn (a Little) Aramaic from Your New Testament. 7:38 AM God bless Lee Duigon for finally bringing some sanity into the discussion of moral law. Over at Chalcedon he rightly assesses the damage being done to people by what I call judge abuse. As icing on the cake Lee's article has some excellent quotes from Judge Roy Moore, a true Christian statesman. UPDATE: My friend Chuck Baldwin chimes in. Warning: His essay is for those with strong stomachs only. 7:27 AM ETHIOPIA UPDATE: Many of you have asked for an update about our various Ethiopian ministries, so Becky prepared the following report. Hold on to your hats -- you're in for quite a ride. Solomon (the Bible school student who needed living expenses). A seminary student from Oregon has sent us $1000 to pay for Solomon’s living expenses for 1 year! It is awesome to both Solomon and us that our Lord established this bond between seminary students living so far apart. Solomon is currently down with pneumonia, probably in part because he hasn’t had proper nutrition for so long. That is now changing, praise His name! Bibles for Children, Diglot New Testaments, and Study Books for Youth. The entire sum was donated to us by a couple in Michigan. Their testimony is that they had been setting aside funds for the Lord’s work, but didn’t know where to send it; upon hearing of this memory program, the Lord said “send it to the Blacks for the Bibles”. So even before we had met with the elders to discuss this memory program, our Lord was setting aside funds for the purchase of the Bibles! We have already reserved the Bibles and books, and have wired a deposit; we will pay the rest upon arrival, and will spend hours putting dedication stickers in the front. Please pray for the children and youth as they are memorizing their verses. The youth have about 15 long passages to learn; the children have about 9. 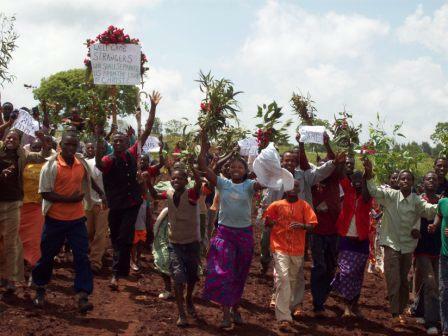 There are 700 children and 300 youth in the Alaba and Burji districts in this memory program. Please pray for each one to be diligent and for the elders as they listen to the verses, that standards will be kept high, and that the passages will open many good discussions about Truth. Flannelgraph. All 3000 pieces have been received; the Feltsource gave us a 25% discount, and a local church donated flannelgraph they had to supplement what we had purchased! And almost all those thousands of pieces have been cut out! The Lord brought me literally an army of women to help cut! How thankful I am to a lady in Georgia and the students of Southeastern Baptist for their help! This truly has been a labor of love. The flannelgraph was paid for by the same couple who supplied funds for the Bibles. As soon as all of the pieces are cut, then I will have the huge job of making subsets. Each subset will deal with a section of Scripture (life of Abram, life of Jesus, parables, Acts, etc.). Then my son Nathan will make backgrounds for the sets, and I will sew cloth satchels for each set. In this way, the subsets can be rotated around the various rural churches in Alaba and Burji. So this job is far from done. Please pray for our Lord to give me grace in putting the subsets together in the most time-efficient manner. It’s easy to feel overwhelmed with 3000 pieces! I would like to get this project finished this month (October). Flip Charts for Bible Stories. I have not done anything at all with this project. This is a matter of simply purchasing and taking. I’ve been focusing attention instead on those project that required much labor and preparation. Laptops and Projectors. We have purchased 3 laptops and 2 projectors; also a laptop has been refurbished and given to us. The laptops we purchased are Toshiba, which is the most common brand used in Ethiopia. This will allow easier servicing. Toshiba was running a special in September; for $700 we got a Satellite M30X laptop, with CD, with Works, with good-quality carrying case, and with printer. In addition, we purchased an extra battery for each computer. We are currently in the process of customizing the laptop to the Ethiopia situation. We also purchased 2 projectors and the cords necessary to work off the laptop. Someone in a Raleigh church is helping us set them up so that they can operate in the bush of Ethiopia, using car batteries. It may seem strange to you to be taking such high-tech stuff to Ethiopia. Mind you, we ourselves do not even own a laptop! When our son Nigussie asked us to bring a laptop for him last spring, it was a real leap for me! For the sake of the Kingdom, I had to learn about laptops. During our summer trip, we saw the effectiveness of this little machine! Imagine living without books…no resource books, no Bible, no commentaries…and trying to grow spiritually, trying to learn about our Lord and understand His word. This is the situation of most rural pastors and evangelists in Ethiopia. He usually has his one Bible, but otherwise he has no resource books or commentaries. Yet he is responsible for the spiritual care of hundreds of people! Now imagine what it would be like not to have any movies (DVDs, video, TV, etc.). No books and no movies. The single most effective tool in reaching Muslims and Animists for our Lord is the Jesus Film. We have seen this film shown on a little laptop with people crowded, crowded, crowded around, straining to hear, straining to see, being happy with any little bit they can get! When it is shown in the privacy of a home, the people are introduced to Jesus without having to deal immediately with a public disclosure of their interest; this is especially helpful when dealing with Muslims, where being ostracized is common. Mama B and Papa B. This is the good news which I have done in Alaba and other places. First of all the children in Alaba are memorizing the verses. Some of them are almost finished it and longing your coming. In both No.1 and No.2 KH churches I have trained 35 Sunday school teachers with certificate. It was very good. As we discussed they need more Sunday school materials. Also I have told them you will train them in coming December. They are happy to see you. As my brothers told me after we came to Alaba many people (Muslims) came to watch it. If I had a camera you would have seen it. We gave them a promise that we would return to them again. I think for future time this Lap top will help us more in our ministry. As I realized the warm feeling of the people there, I am very much interested to continue the ministry and discussed with brothers to enhance the film show evangelistic mission around the Muslim areas. I hope you would have the opportunity to attend one of such meetings with them when you come. Mammy, is it possible to get the other Lap Top for me, even the used one? If we can get it …Wow! So you can see that even though we ourselves do not own a laptop, this is a piece of technology that opens door in a tremendous way in Ethiopia! The evangelists can take the laptop into the rural areas where there is no electricity, and then recharge the batteries when they return to a town with electricity. In addition to the Jesus Film, we are supplying a CD produced by the Lapsley-Brooks Foundation. This CD is a library of 100 (!) books, in English and Amharic!! The books range from prophecy and commentaries to Christian living and church history. So a single laptop provides the means not only for evangelism, but also for spiritual growth and nurture. The Foundation is currently producing its second CD, and we have other teaching CDs in English that we are taking. As you can see, the laptop-and-projector project is one of the most effective projects we’ve been involved with! Money has been sent for one projector, and we are using undesignated gifts to help with this expense. But this is our greatest financial need at the moment. We made the purchases on credit, so the bill isn’t due for another month. If you feel led to help with this, we’d appreciate it. Muhammed and the Norlina Church. This is such an exciting story, I just have to share it with you! 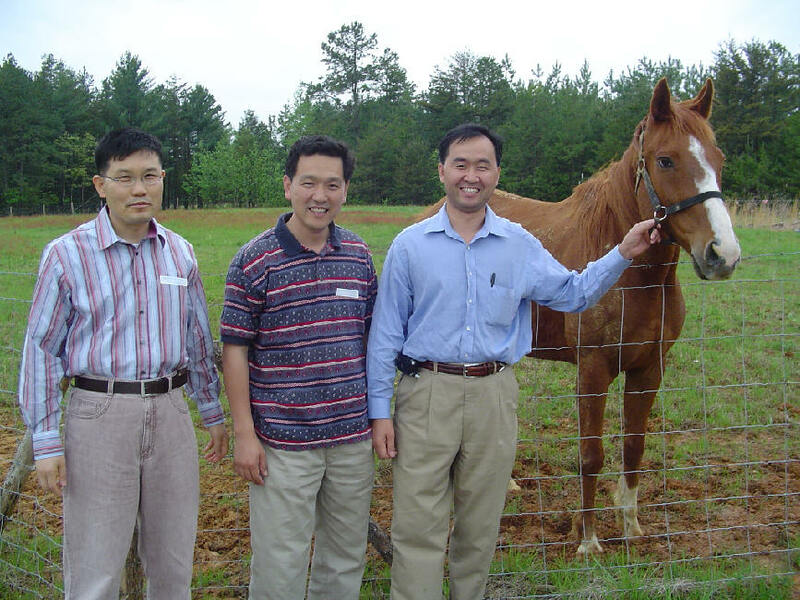 Recently Dr. Black spoke several times at a little country church in Norlina, NC. Our last night there, we spoke on Ethiopia. (We did a trial run with one of the new laptops and projector…it worked perfectly!) Just a few days before speaking, we had received a letter from Muhammed. The letter was difficult to read; its English was rough and its handwriting was coarse. Who is Muhammed? He is a man that we met literally on the streets of Addis. Our son Fasil was driving me to various places and saw his friend Muhammed walking; we gave him a ride and in the process I got his testimony. Muhammed is from a section of Ethiopia that is almost 100% Muslim. He attended Koran school and rose thru the ranks to become a leader in spreading Islam. In studying the Koran he began to see that Jesus is indeed God, the Saviour of the world. Yes!!! When various teachings of the Koran are put together, the logical conclusion is that Jesus is God Himself, and the Saviour of mankind!! After coming to Christ, Muhammed began sharing this with others in his Muslim community, and before long he is winning many, many to our Saviour! I asked him what was his greatest need: “BIBLES! I need Bibles! I can teach them about the Saviour only a little from the Koran; we need to study from the Bible!” So immediately, Fasil changed directions, and we drove to the Int’l Bible Society to buy every Bible that my wallet could fund. I wish you could have seen Muhammed’s face!!! Such ecstasy! At his request I wrote in the front of each Bible. After prayer, I wrote “This Bible is given to you with the love of our Lord and Saviour Jesus Christ”. He took those 16 Bibles back to his area, and his letter to us contained the names and signatures of the 16 men who had received those Bibles! Muhammed is working with the leading men in his area; if a Muslim man comes to Christ, his entire family changes….such is the power of a man over his family. So the 16 signatures are actually 16 families! Anyway, getting back to the Norlina church, we told them about Muhammed. Spontaneously, in response to the Spirit, this group of believers took a love offering…$991.75! Even the children were bringing their money! We pledged to them that 100% of the offering would go to Muhammed. That night I emailed Muhammed asking him what his needs were for this next year (Ethiopia’s New Year is September 11). He wrote back: Bibles, chairs, transportation money, room rental money. His request was an almost perfect match with their collection! Later that night, a lady gave us a check and a quilt! 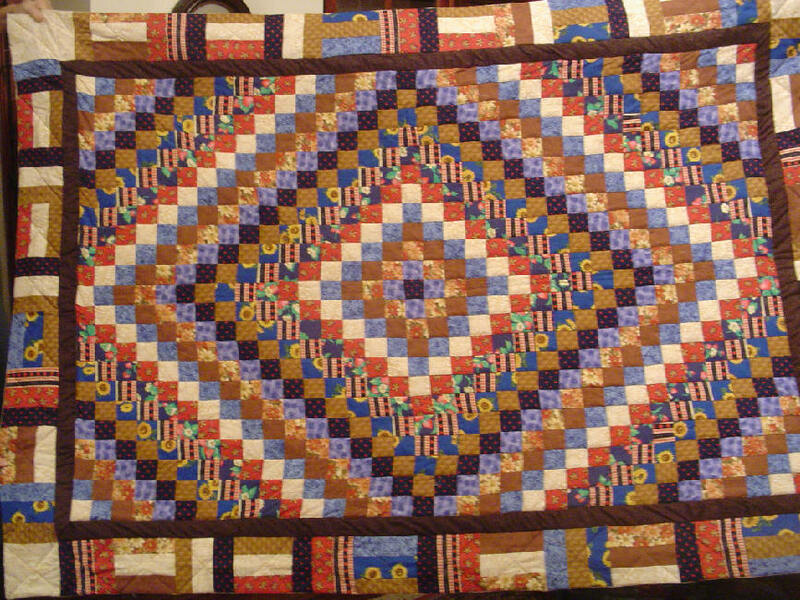 The quilt will go to Bereket and the check will be applied to a laptop for Muhammed. And the church is now gathering eyeglasses! Not only are they gathering eyeglasses, they are also having sewing sessions to make some cases for the eyeglasses!!!! And they are beginning to talk of going with us on our next trip! Once again, our Lord has shown us how HE is the one who is doing this work! HE goes before us preparing the way, HE gives us the ideas and helps us to see the needs, HE gives us grace in the eyes of others and provides helpers, HE arranges communications. To HIM goes all the glory! Please continue to pray for us as we prepare. It is now 10 weeks to departure time. I am working as much as I can at the hospital to put together the funds for our personal expenses (airfare, in-country food, and transportation, etc.). I’m working on customizing the laptops, making the flannelgraph subsets and satchels, as well as attending Dr. Black’s speaking engagements. A special prayer request is that our Lord will prepare the way for us to get these laptops and projectors into the country. The best plan, I think, is to have individuals who are going to Ethiopia carry them onboard with them; so I’m looking for people who are traveling to Ethiopia in the coming months. Please pray for this need. Well, I think that about covers all the bases. If you would like to help financially, the greatest need we have right now is for funds for the laptops and projectors. 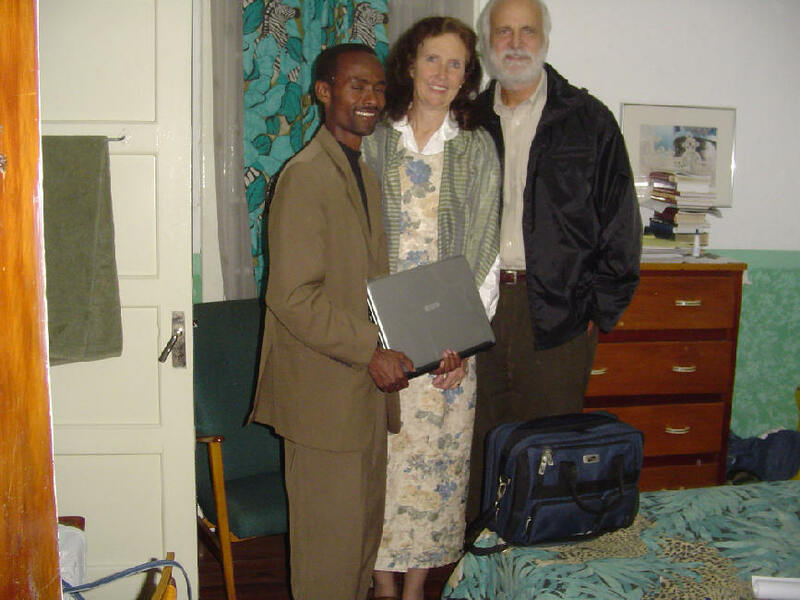 If you would like to pray, please ask specifically for strength and wisdom for us, for carriers for the laptops and projectors, and for Bereket’s spiritual and visual condition. We love and appreciate you! Each gift of labor or finances still is a shock to us…it is such a wonder to us that our Lord would burden others with our need. Thank you for your love for us and Ethiopia. May the One who sees all reward you for your kindness to us and to those in Ethiopia whom we love. ... the Church must offer the gospel in ways “appropriate to changing times, intelligible and attractive to our contemporaries”. Sounds to me like a new Windex Cathedral may be in the offing. 7:58 AM Now here's a lifestyle I admire. Our ambition is to work hard, mind our own business, lead a quiet (simple) life, work with our own hands in an effort to gain respect of those around us and to remain independent (I Thessalonians 4:11). We seek hard work knowing it benefits our fitness and productively occupies our leisure. Our products are handled personally with minimal reliance on machinery, keeping things quiet and simple. 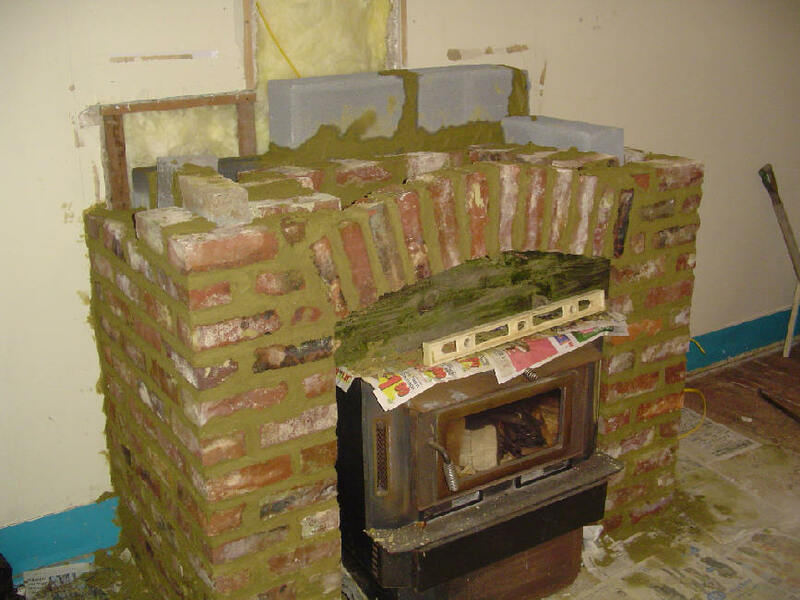 That wood stove insert should throw off a lot of welcome heat come winter. 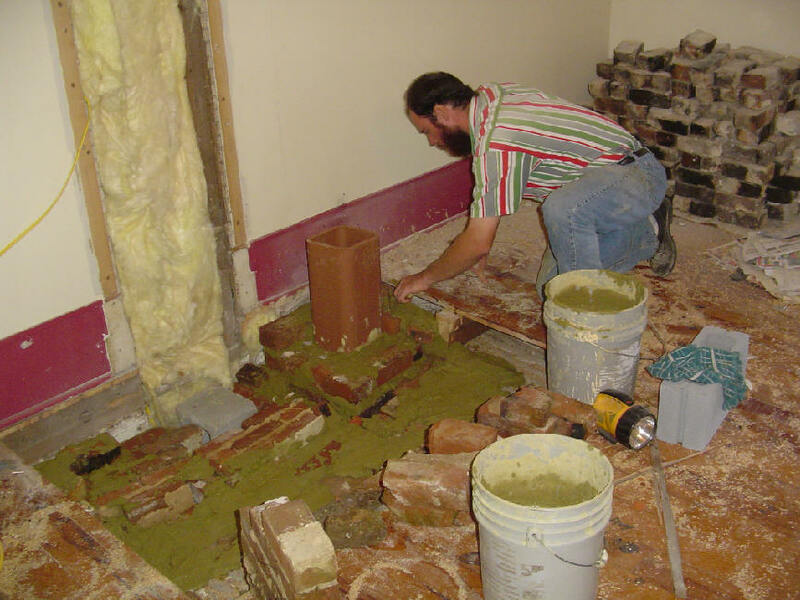 The Lord held off the rain all day so that we could mix the mortar and retrieve the bricks from outside. Then He opened the spigot of heaven and our parched earth just drank it in. To top things off, I cooked my specialty for supper (Chinese food, of course, with my secret ingredient) and we watched a movie I had ordered on EBay. 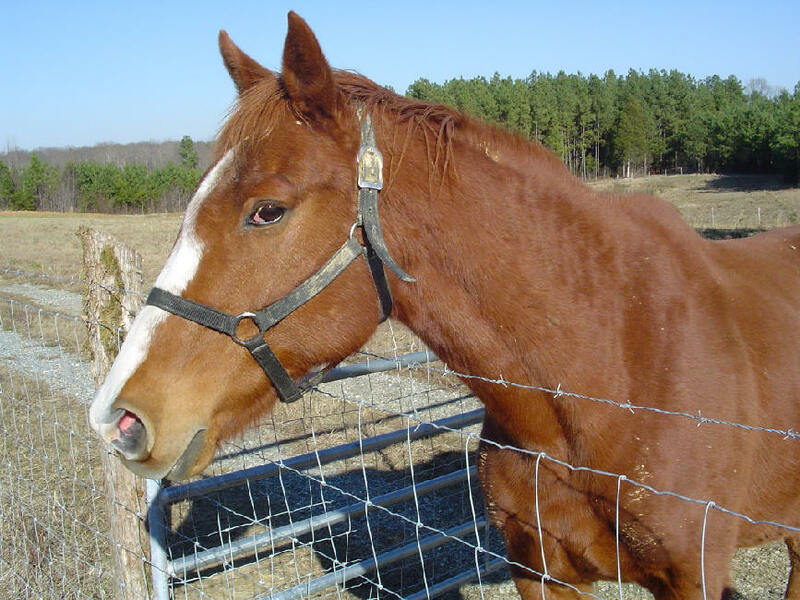 The Wooden Horse is a classic WW II escape thriller. Below: Stalag Luft 3, site of the escape. 7:50 AM I am currently completing a sermon called The Nine Marks of a New Testament Church. It is based on Acts 2. 7:48 AM Alliance University College in Alberta announces an opening in New Testament. 7:46 AM Have you visited The Wrestling Mat yet? 7:43 AM Over at Still Reforming there's a good discussion of Bible translation philosophy -- especially the question: What to do with those big "theological" words? 7:33 AM The Constitution Party (aka the American Independent Party) has scored a major victory in California. Heartiest congratulations, Jim. I will be praying for your success in the runoff. 7:30 AM I almost forgot. Praise the Lord for sending us some rain yesterday. It was sorely needed and greatly appreciated. 7:28 AM I won't say I'm not tempted to check out this event over the weekend. It will even have a luau. 7:25 AM Take my textual criticism course next semester and you will be able to read this beautiful manuscript from the eleventh century (Evan. 348). 7:20 AM Ethiopia's adoption dilemma. 7:18 AM One reason I'm having a hard time learning Amharic. 7:15 AM What planet have I been living on? This excellent site has been around for some time and I'm just now discovering it. 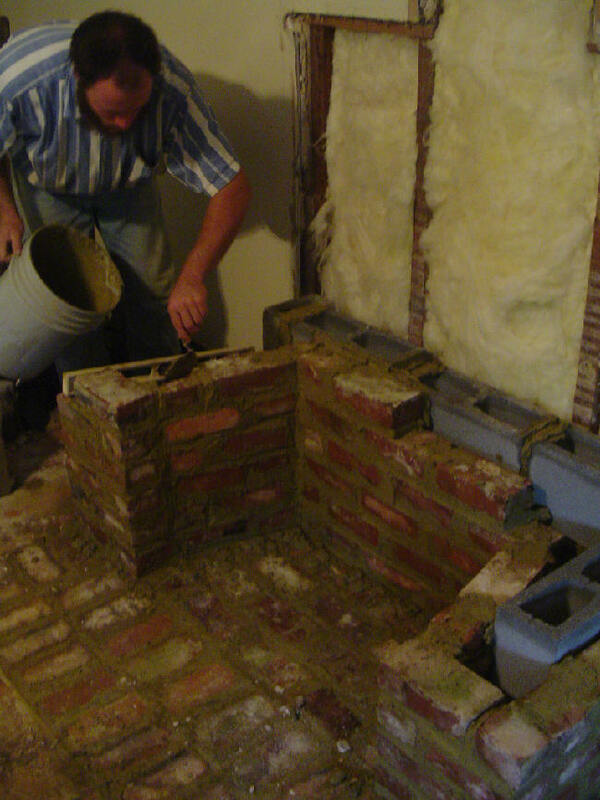 7:10 AM The master builder at work on his fireplace and chimney. Here Nate sets the foundation. And here he is at the end of Day Two. The bricks we got from a neighbor's old farmhouse that had burned down. Before you could say "Nathan is the world's greatest scavenger" we were there to round them up (with our neighbor's permission, of course). As for moi, I'm the gofer. I mix the mortar, haul in the bricks and concrete blocks, clean up afterwards, and otherwise make sure the architekton is happy. We have a blast working together, even if the work is exhausting. 8:29 AM This is a tremendous testimony to the value of a cybernetic community. Thank you, Lora, for this reminder of the way God uses even our Internet friends in times of need. Once we had our plan I decided to e-mail our friends and let them know what was happening in our lives and to also see what they were going to be doing. I sent out the e-mail and got many responses. God used this time to truly show me what His family is all about. We had many offers to stay with friends, some from our newer cyber friends. Their offers of hospitality brought tears to my eyes. We received offers from California, Virginia, Illinois, and Alabama. These were all from our cyber friends we had never met in person, which made the invitations even sweeter. We had several offers from friends here also. God really showed us through this storm what a wonderful Christian family we have and how important it is that we show His love to people in tangible ways. 8:15 AM Please read Jay's prayer request in you haven't done so already. Having recently gone through a 3-year building process myself I can empathize with him. Jay, what you said about God's timing and faithfulness is absolutely true. Meanwhile, we will stand with you and your family in daily supplication. 8:10 AM Quote of the day: “An Obituary For Jesus,” from The Economist, Easter, 1999. The uncompromising Christian message of love, humility and charity is at variance with common human behavior. Yet nearly two billion people unblushingly call themselves Christian, happily breaking almost every commandment should the occasion arise, serving Mammon and goodness knows who else. 8:06 AM We've made many farm purchases, but a portable sawmill is not one of them. We're still in the "let-others-do-the-sawing-we'll-do-the-planing-and-installing" mode. The pines we sold yesterday to the local (portable) sawmill operator brought in a nice check, which we duly "invested" by making two trips to the hardware store for mortar, cement, concrete blocks, and flues for the chimney. Work continues to today. Pics shortly. 8:02 AM Chad Degenhart stirs up the waters by questioning the reasons why parents send their daughters off to college to prepare for "careers." Chad is sometimes regarded as anenfant terrible, but only because of his habit of challenging established ideas and cross-examining everything -- my kind of man exactly. 8:00 AM A warm "thank you" to Richard Erickson and InterVarsity Press for sending me a complimentary copy of Rich's new book A Beginner's Guide to New Testament Exegesis. Looking at the "side-Barr" on pp. 106-107 I can already tell I'm going to enjoy reading it. Rich is the director of Fuller Northwest in Seattle and had me teach two summers for him there -- my first introduction to Seattle's Best Coffee, by the way. 8:12 AM The latest addition to our home page is called Is It Too Late For America? 7:59 AM C. S. Hayden has some excellent thoughts about Bush's latest Supreme Court nominee. It is well worth digesting when you have the time. 7:54 AM O, the love of Greek! 7:50 AM "I will lift up mine eyes to the hills." Whenever I read Psalm 121:1, I always think of the powerful Koolau Range, known to those of us who lived in Kailua as the "Pali." The Island of Oahu was formed from the coalescing of the Koolau Range with the Waianae Range.Several large bays receive runoff from Oahu's streams, including Pearl Harbor, Mamala Bay, Kailua Bay, and Kaneohe Bay. Deep valleys and interfluvial ridges are everywhere to be seen today. Growing up, there was never a day when I did not consciously marvel at the handiwork of God, even as I do today whenever I look out the windows of Bradford Hall. For more spectacular aerial views of my home island, go here. 7:41 AM Happy Anniversary to a wonderful website, the Engstrom Family Cerebrations. 7:39 AM The monastery on Mount Sinai now has its own website. You can read it in Greek, English, or Arabic. 7:35 AM The book of Hebrews and theology is the topic of this conference in Saint Andrews, July 18-22, 2006. Other than the Gospels, Hebrews is my favorite book in the New Testament. It shows that Christianity is the true successor to Judaism and that we are all priests before God. It establishes the supremacy of Christ over all men, even mega-leaders. This, of course, is a key aspect of Pauline theology, and elsewhere I have argued for the Paulinity of the book -- a truly obscurantist viewpoint if ever there was one. The books or the music in which we thought the beauty was located will betray us if we trust them; it was not IN them, it only came THROUGH them, and what came through them was longing. These things -- the beauty, the memory of our own past -- are good images of what we really desire; but if they are mistaken for the thing itself they turn into dumb idols, breaking the hearts of their worshippers. For they are not the thing itself; they are only the scent of a flower we have not found, the echo of a tune which we have not heard, news from a country we have not visited. 7:23 AM The head of the NSA during the Reagan administration asks a vital question: What's wrong with cutting and running? He sees some imperial retrenchment on the way, and it cannot happen too soon in my opinion. UPDATE: Scott McConnell also makes some illuminating connections over at AmCon magazine. 7:19 AM The BBC does it again with this moving story about the power of a photograph. My heart and prayers go out to all our service men and women and their families. 7:15 AM In a day of theological pabulum I am not surprised to read about a new seminary whose entire curriculum is based on drivel. Of course the atrocious thing is that we in the churches will continue to suffer from more and more cases of biblically illiterate pastors. 7:12 AM Simpson University in Redding, CA, announces an opening in New Testament. 7:07 AM We will be doing this -- a largely forgotten art -- in our textual criticism class next semester. 7:07 AM The latest addition to our home page is called Female Bloggers. I also hope to get some writing done on my book Unleashing the Church as time permits. Amazingly, yesterday was my last Sunday at my home church until December 11, just before we leave for Ethiopia. Becky and I will be on the road again, speaking at various area churches. It's just two Saturdays until our Student Day at Bradford Hall. Here's a photo of last semester's event featuring some of our Korean students. This is always a time of great fellowship. 7:59 AM For a thorough discussion of tithing from a New Covenant perspective, go here. 7:54 AM A huge Bradford Hall "thank you" to Joshua (of my Greek class) and Brantley Parrott who spent the day with us yesterday working on various farm projects. You will look in vain for a more generous or warm-hearted couple. Among other tasks we painted the barn roofs (see below). For supper, Becky Lynn prepared some fabulous spaghetti made with our own goat meat, topped off with strawberry shortcake for dessert. maneuvering prior to the war by Lincoln and the government that just floored me and never heard before. 7:42 AM Over at the Founders Blog, Tom Ascol is at his tongue-in-cheek best with this blog post. 7:40 AM The Constitution Party has a stellar line-up of candidates this year. You can read about them for yourself here. 7:36 AM Here's the Greek papyrus fragment I tried to link to the other day. Bryan Cox ofBiblaridion was kind enough to email me the correct hyperlink. The manuscript is none other than p52. Note Bryan's nifty annotations. 7:37 AM It's nice to see Evan Black blogging again. 7:34 AM Humility can be harmful. 7:30 AM Nathan Grooms has posted an excellent review of one of the great books of our time. 7:26 AM A loving heart over at Norlina Baptist Church made this quilt and gave it to us for our Ethiopian son Bereket. We will take it with us when we leave in December. It is a precious gift for a precious young man. 7:22 AM The latest addition to our home page is called A Clock from Switzerland.